© 2002, © 2018 by Paul Freeman. Revised 8/22/18. 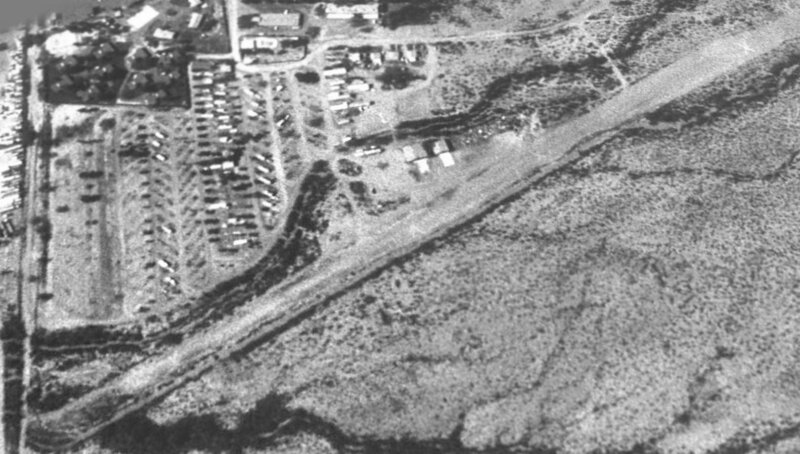 A 1992 USGS aerial view looking northwest at Gringo Pass Airfield. 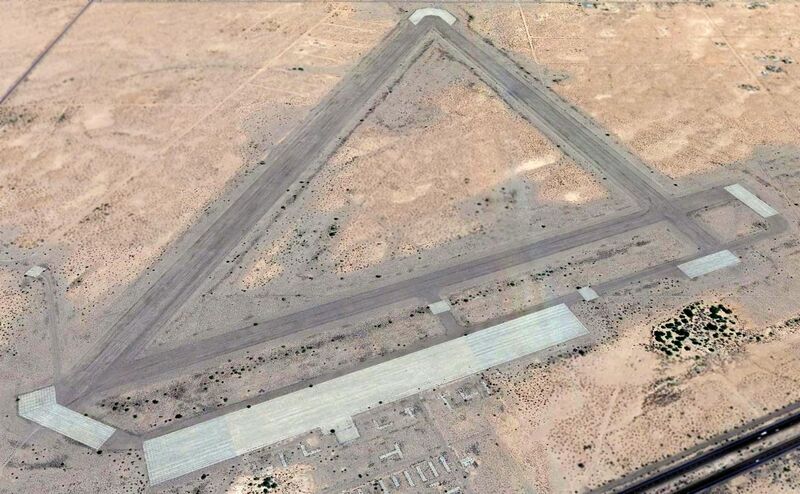 This curious small private airfield was located directly adjacent to the Mexican border. with takeoffs to the north, and landings to the south, so as to avoid crossing into Mexican airspace. 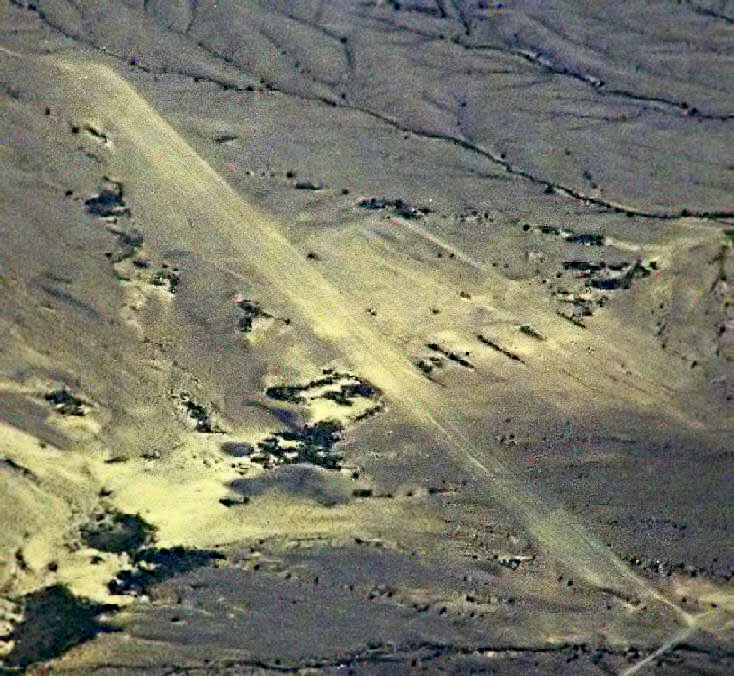 The date of establishment of Gringo Pass Airfield has not been determined. It was not yet depicted on the 1988 USGS topo map. Richard Carlson reported in 2018, “According to a Border Patrol agent I spoke to the airstrip was part of the adjacent RV/trailer park owned by a local that may have been part of the Frontier Airlines ownership. According to the agent he died a few years ago & his heirs abandoned the operations. According to a 7/15/04 Tucson Weekly article, property owner Al Gay would fly down in his Beechcraft often. If the stories about him are true it is a good bet he never registered the airstrip. 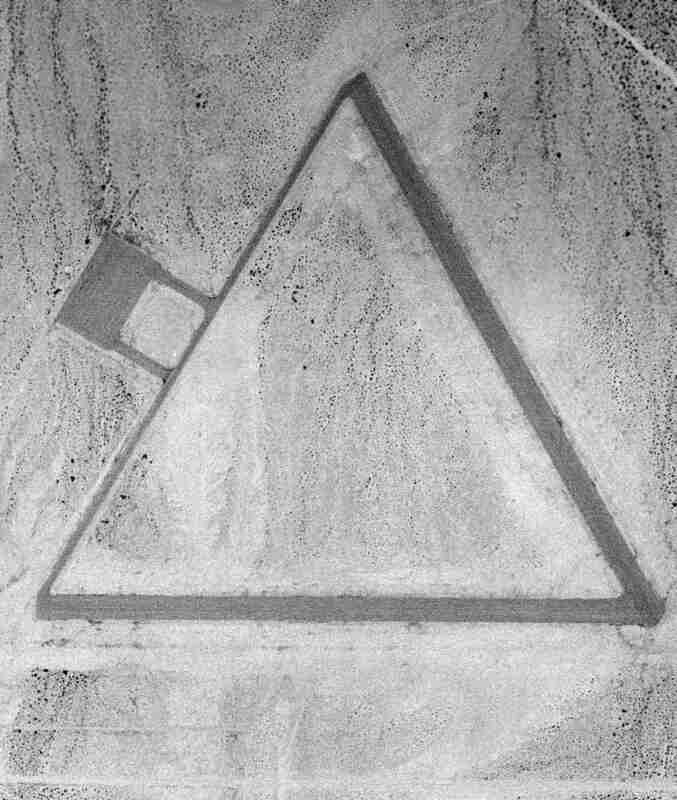 The earliest depiction which has been located of Gringo Pass Airfield was a 1992 USGS aerial view. 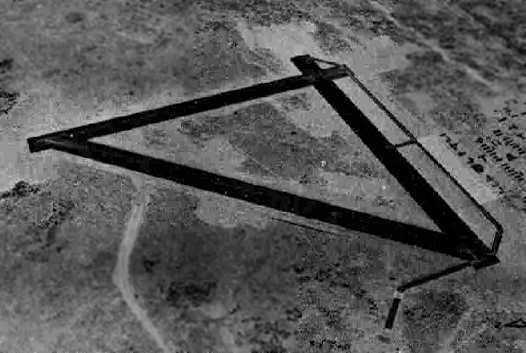 It depicted a single north/south runway, with a closed-runway “X” symbol visible on the north end, and 2 small buildings on the west side. 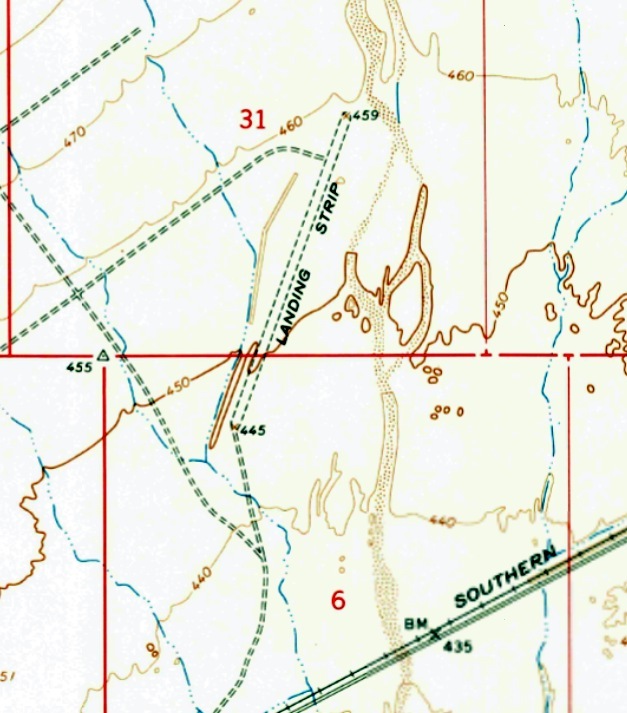 The only topo map depiction which has been located of Gringo Pass Airfield was on the 2000 USGS topo map. It depicted a single unpaved north/south runway, labeled simply as “Landing Strip”, with 2 small buildings on the west side. A 2017 aerial view looking northwest depicted the remains of Gringo Pass Airfield. The majority of the runway remained intact, though deteriorated, and the closed-runway “X” symbol still barely recognizable on the north end. The 2 hangars also remained on the west side. A 1/6/18 photo by Richard Carlson of the larger remaining hangar at Gringo Pass Airfield. 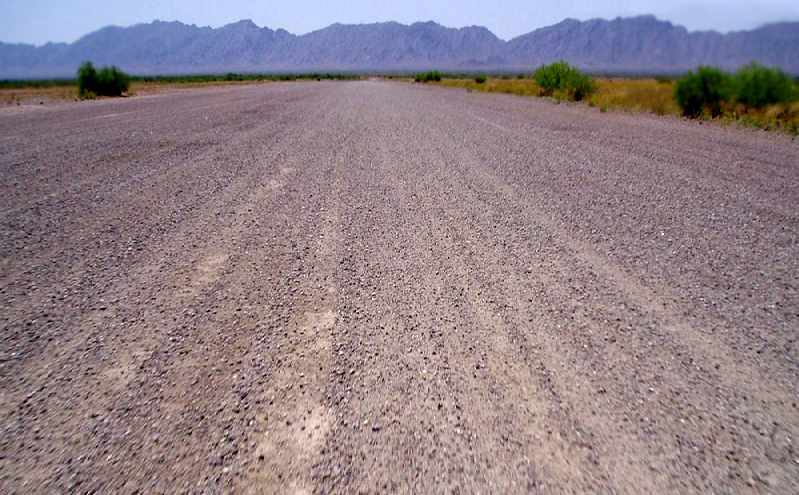 Richard Carlson reported in 2018, “Hard by the Mexican border in Lukeville, 40 miles south of Ajo, this pea-gravel airstrip is still in decent condition although likely has not seen a legal movement in years. The south end of the airstrip is about 250' from the border wall. The airstrip is about 2,000’ x 50’, surfaced with pea gravel. I was unable to travel to the ends of the runway due to the presence of the Border Patrol. About midway on the runway is a pea gravel tarmac with 2 small hangars. The larger one has a wood truss roof & is currently sans door. It is apparently used for storage as there is an end-loader inside along with an owl’s nest. Directly north of this building is a smaller hangar with the skeleton of a windsock still on a pole of the roof. 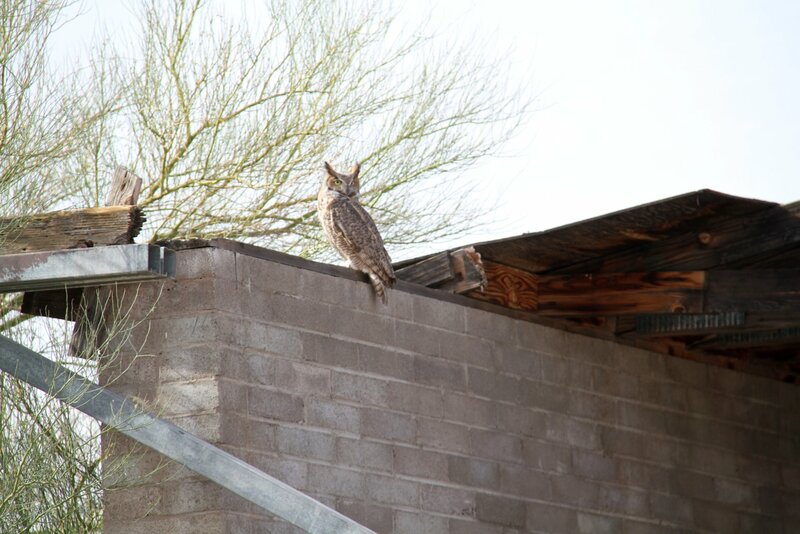 A 1/6/18 photo by Richard Carlson of the only aviator who still uses Gringo Pass Airfield: a majestic-looking owl perched on top of the larger hangar. A 1/6/18 photo by Richard Carlson of the smaller remaining hangar at Gringo Pass Airfield, topped by a windsock frame. A 1/6/18 photo by Richard Carlson of the remains of a windsock frame on top of the smaller Gringo Pass hangar. Richard Carlson reported in 2018, “When I visited there the trailer park had about a dozen trailers but none seemed occupied. A couple cars were parked at them but covered in dust. The office was locked & peering inside the window there was a heavy layer of dust there (if you have never been here, dust is more common than dirt). The only activity I saw on the property was a Border Patrol truck parked next to the north building watching for border jumpers. As I left the area I flagged down another Border Patrol agent & spoke to him. He told me the owner died a few years back & the place was pretty much abandoned. The gas station & store were sold by the family but actual ownership of the RV park & airstrip is unknown now. It is unknown if anyone other than Al Gay ever used the airstrip. Due to the fractured relationship with the government it is very unlikely that it was ever used for any official use. 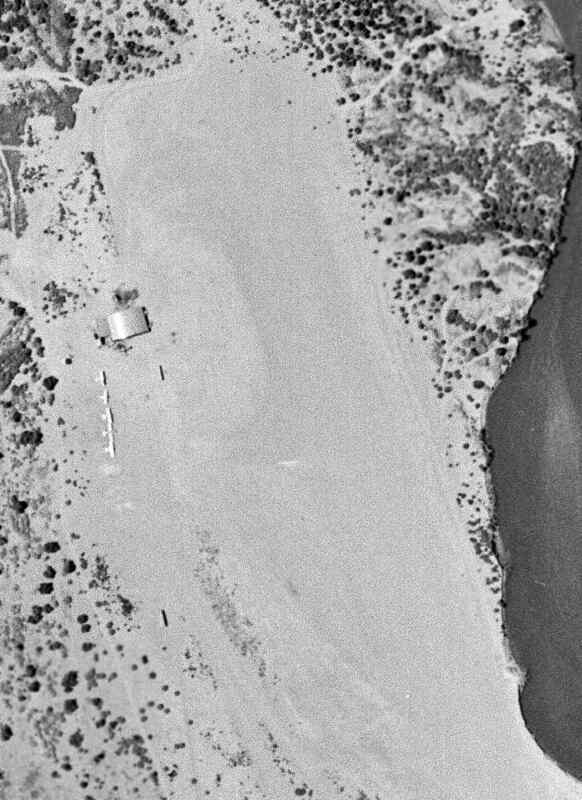 A 7/12/48 USGS aerial view of Marsh Downtown Airport. 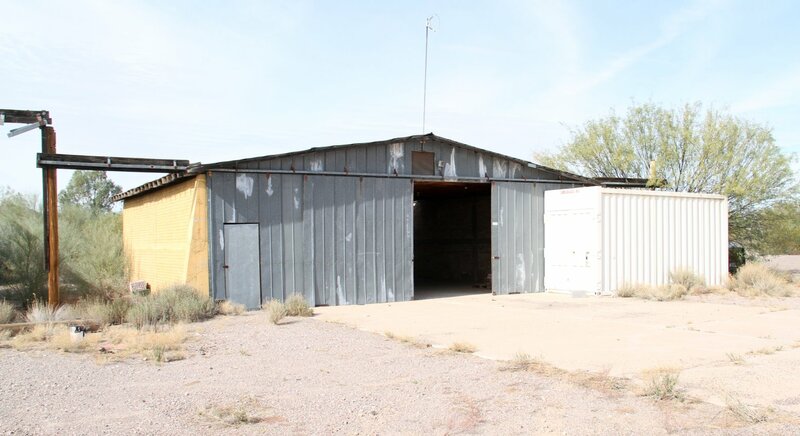 This small general aviation airport was located adjacent to the east side of Downtown Yuma. which depicted it as having a single unpaved northwest/southeast runway. showing 6 light single-engine aircraft parked next to a hangar on the northwest side of the field. The earliest aeronautical chart depiction which has been located of Marsh Downtown Airport was on the March 1952 San Diego Sectional Chart. It depicted Marsh as having a 3,900' unpaved runway. 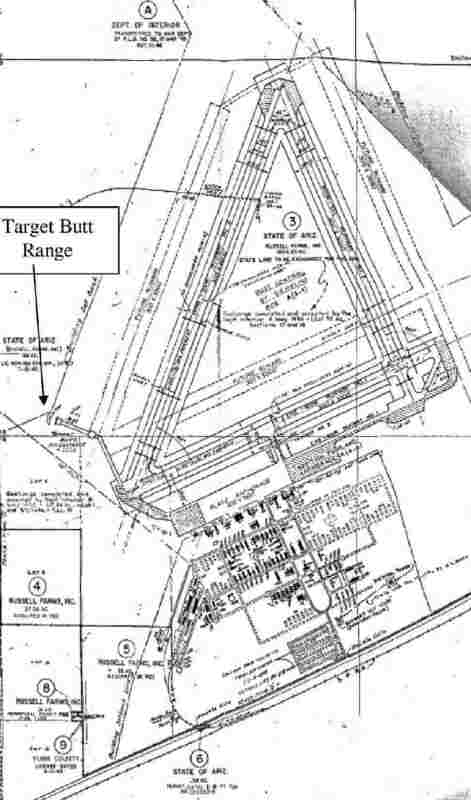 labeled simply as “Airfield”, with a ramp & a single building on the northwest side. The last aeronautical chart depiction which has been located of Marsh Downtown Airport was on the 1955 Phoenix Sectional Chart. mentions Marsh Airfield, which was also called Marsh Downtown Airport. 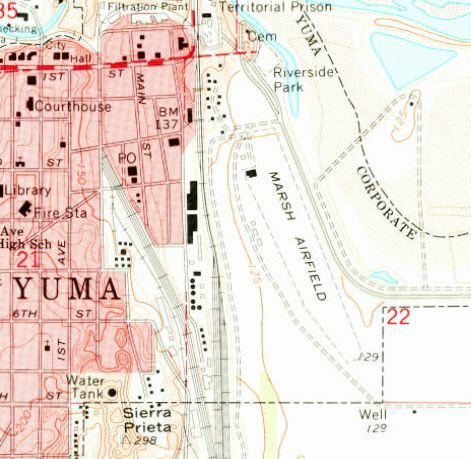 It was located east of downtown Yuma, just east of the railroad tracks & the Yuma Territorial Prison, on the south side of the Colorado River. and on July 4, watch the fireworks which were set off from a large raft anchored out in the river. My brother & I also flew out of Marsh Field once when Mr. McVay, a friend of our dad’s, took us for a short hop in a Cessna 172 around 1958.
and 3 individual T-hangars had also been added at some point between 1948-62. 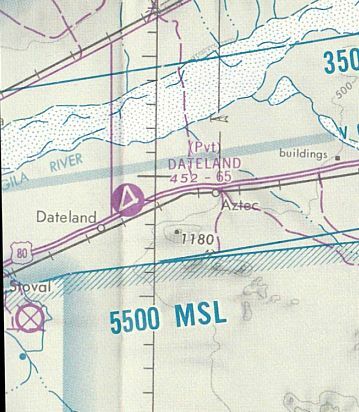 The 1975 USGS topo map continued to depict Marsh Airfield in an unchanged manner. 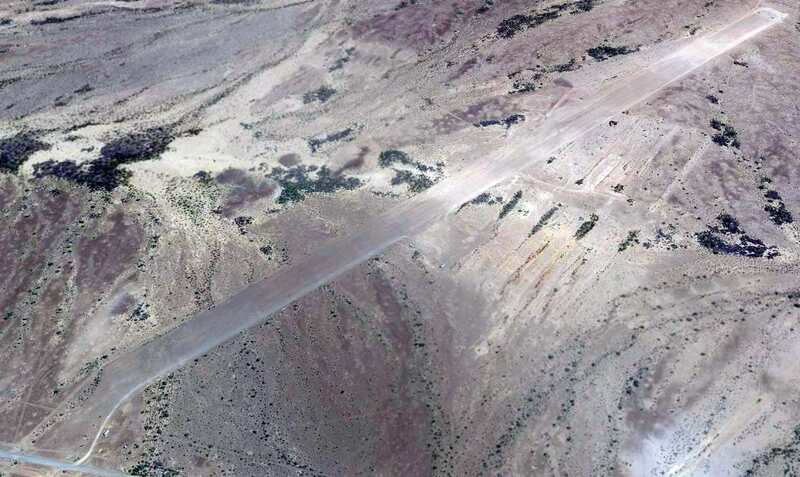 as the 1979 USGS topo map showed Interstate 8 had been built right over the runway, obliterating the little airport. A 1994 aerial view showed no trace of Marsh Downtown Airport. A 2011 aerial view showed no trace remaining of Marsh Downtown Airport. The site of Marsh Downtown Airport is located at the intersection of Interstate 8 & Harold Giss Parkway. Thanks to Duncan Woods for pointing out this airfield. McDaniel Field, as depicted on the March 1952 San Diego Sectional Chart. Photo of the airfield while in use is not available. 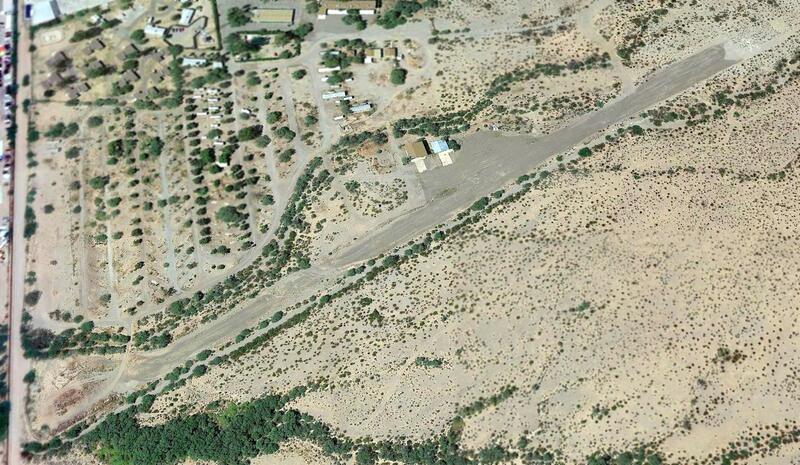 This small general aviation airport was located less than 2 NM east of the Mexican border. it was established some time in the early or mid-1930s by my uncles, the McDaniel boys: Ted, Howard, and Ralph. Ted was the first of the boys to learn to fly & get his license. which they owned for a number of years and was eventually replaced by the Bonanza. perhaps overlooked due to its small size. The earliest depiction which has been located of McDaniel Field was on the March 1952 San Diego Sectional Chart. It depicted McDaniel Field as having a 2,600' unpaved runway. 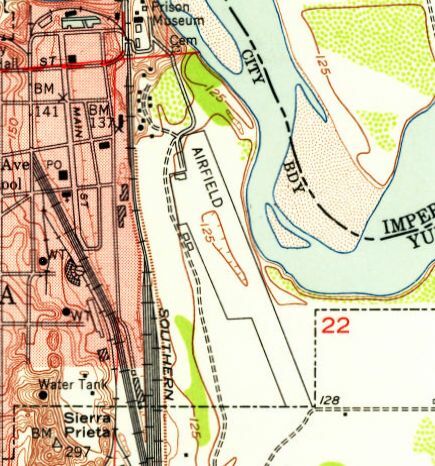 McDaniel Field, as depicted on the 1954 USGS topo map. Duncan Woods recalled, “Ted was the one who was teaching me to fly. By the time I came along, he had several thousand hours in the air & a commercial ticket. The north/south packed-dirt runway was about 2,100'. My Uncle Ralph lived in the house out near Highway 95 for many years. The aircraft were kept there: a Beech Bonanza, a Cessna 140A, and a Piper PA-18 Super Cub. The Cessna was the one I learned in. 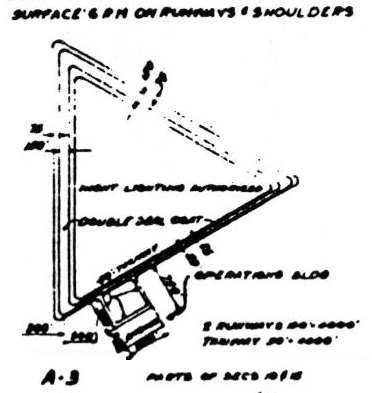 The last aeronautical chart depiction which has been located of McDaniel Field was on the 1955 Phoenix Sectional Chart (courtesy of John Voss). 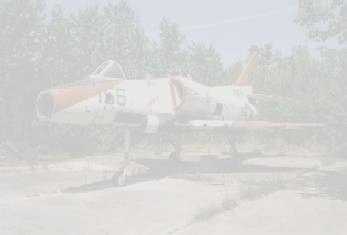 It depicted McDaniel as having a 2,600' unpaved runway. The only photo which has been located showing McDaniel Field was a 1963 aerial view. with 1 small single-engine plane near a few small hangars on the west side. 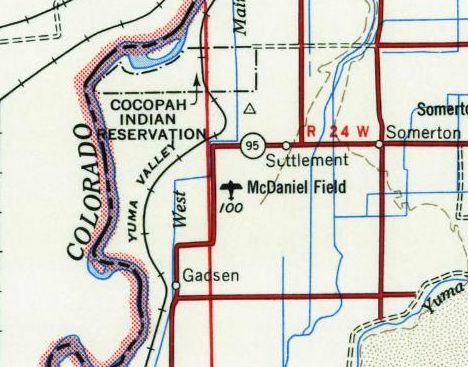 The last depiction which has been located of McDaniel Field was on the 1965 USGS topo map. It depicted McDaniel Field as having an unpaved north/south runway, with an unpaved ramp with 3 small buildings on the west side. and sold off the properties in 1970. All the aircraft had been sold long before, as both Ted & Ralph had stopped flying. Whoever bought the property pretty quickly tore down the hangars & put the entire property back into crop production, according to Ted's son, my cousin Mike. A 2012 aerial view showed no trace remaining of McDaniel Field. Duncan Woods reported in 2017, “I visited my cousin Malcolm McDaniel in Yuma a couple of months ago. He actually grew up in the house by the airfield & lived there until the mid-1950s. His dad was my uncle Ralph. 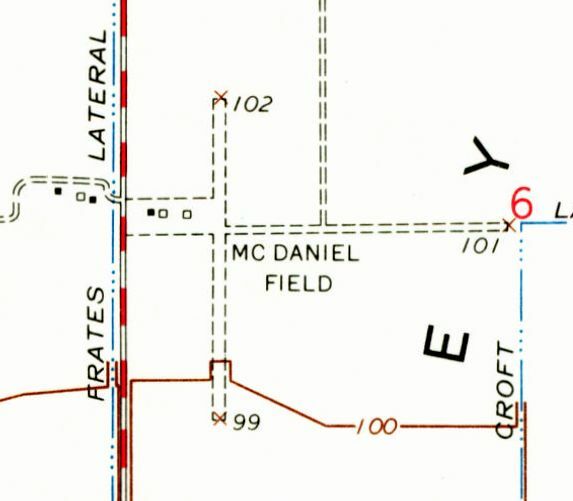 The site of McDaniel Field is located northeast of the intersection of Route 95 & West County 17th Street. 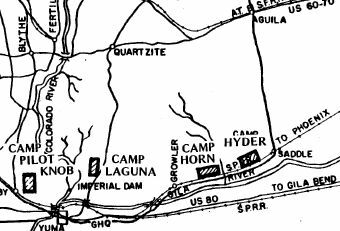 Camp Horn, as depicted on a circa 1942 Army map of the Desert Training Center. to test & develop suitable equipment, and to develop tactical doctrines, techniques & training methods. who reportedly piloted his own plane to examine DTC facilities & units. and eventually encompassed a set of over 11 camps & 9 airfields. Camp Horn was one of the DTC/CAMA camps which featured its own airfield. When the Allied victory came in North Africa, the need for desert-trained units faded, and CAMA was closed in May 1944. Camp Horn & its airfield were presumably never reused for any civilian purpose. 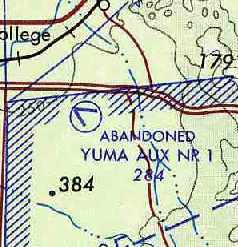 The airfield was not depicted on the 1945 Phoenix Sectional Chart. located east of the extensive street grid of the “Fort Horn Military Reservation (Abandoned)”. in which the single northeast/southwest runway was barely recognizable. 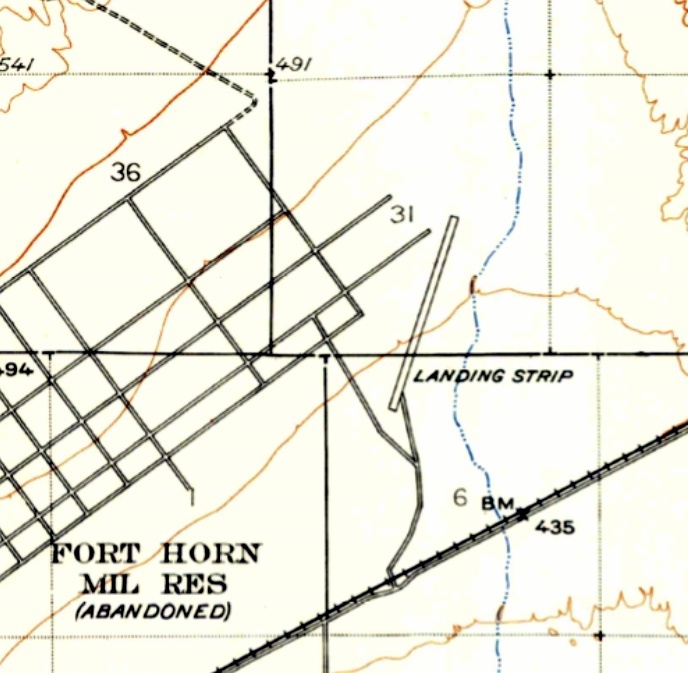 The 1965 USGS topo map depicted the Camp Horn “Landing Strip” as a single northeast/southwest runway. A 3/1/13 aerial view looking north along the remains of the Camp Horn runway, still recognizable 70 years after being abandoned. A 2014 photo by Mike Jamison looking south along the Camp Horn runway. 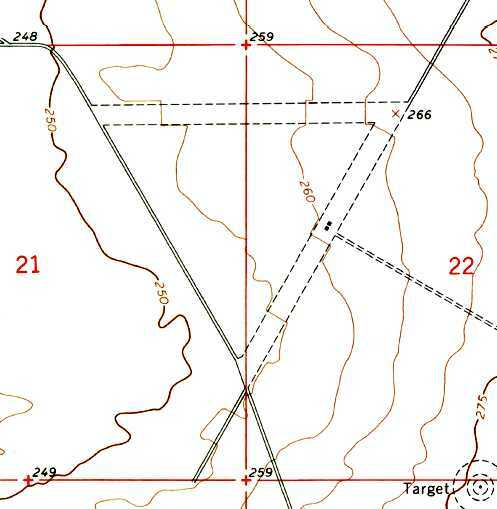 Mike Jamison reported in 2014, “A dirt road leading north from the Camp Horn monument accesses a series of similar roads that form a large & distinctive grid pattern. The gridded area is Camp Horn, which contains several more roads extending east to an airstrip. As for Camp Horn itself, I was transfixed & had a hard time leaving. Innumerable rock-trimmed pathways lead past untold numbers of empty sites that once provided space for tents. so much so that one gets an eerie feeling that Patton's troops might have vacated only months ago. The site of Camp Horn is located northeast of the intersection of Palomas Road & Avenue 64E. A photo of the July 1942 CPT class at Smiley Field, bracketed by 2 Ryan trainers, and with 8 Pipers & other taildraggers in the background. According to Douglas Bell, Smiley Field "was a civilian pilot training field used from 1942 for a few years. During this period, it was operated by the United School of Aeronautics. 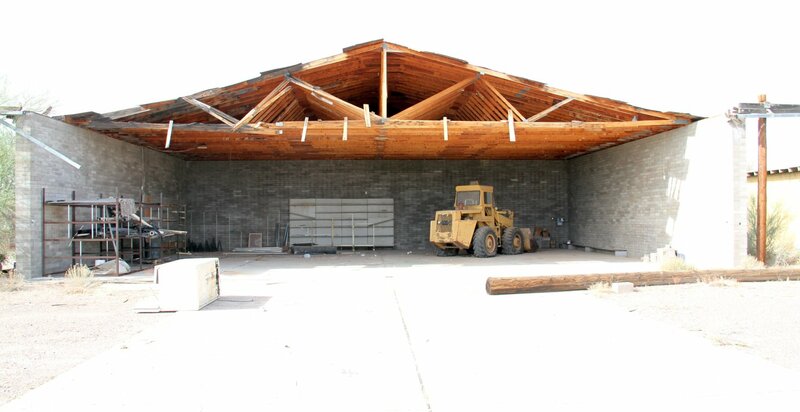 The buildings consisted of a large ranch house & small hangar for repairs. My father was a flight instructor at Smiley Field from February 1942 until April or May 1943.
plus a collection of letters he wrote during that period to his parents. He married my mother in September 1942 & they lived in an adobe house in Wellton - she described it as 'a great time'. at least that is the caption on one pictures." bracketed by 2 Ryan trainers, and with 8 Pipers & other taildraggers in the background. The cadets had barracks and a mess hall at the field & were enlisted reservists. Between primary & secondary training, there were about 60 cadets in all. I learned of an old airfield constructed around 1942. The old-timers called it Smiley Field & claim it was located in the town of Tacna where the post office now stands. consistent with those used in the civilian pilot training program as opposed to a primary training aircraft). 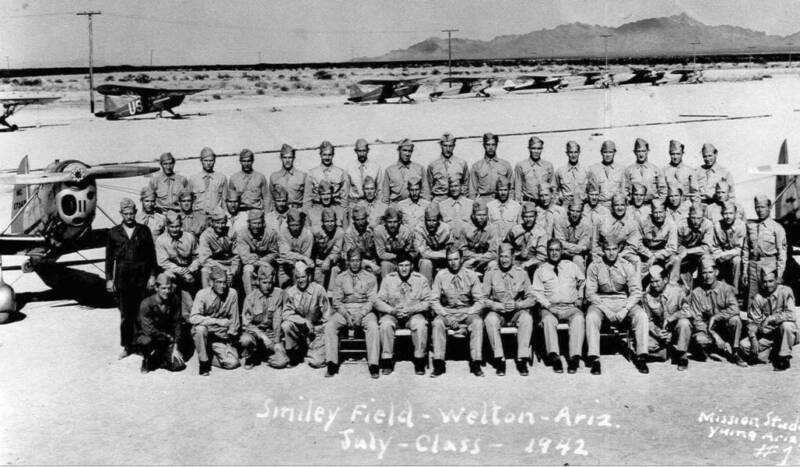 The photo caption reads, "Smiley Field, Welton [sic], Arizona, 1942." was on the August 1943 San Diego Sectional Chart (courtesy of Scott Thompson). approximately 3 miles east of Tacna. described Smiley Field as having a 3,000' unpaved runway. was on the 1945 San Diego Sectional Chart (courtesy of John Voss). 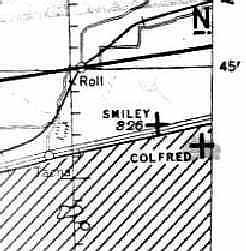 Note that the Colfred Auxiliary Field was also located in very close proximity, to the southeast of Smiley Field. a rectangular patch of ground on the north side of Route 80, with a few small buildings on the east side. 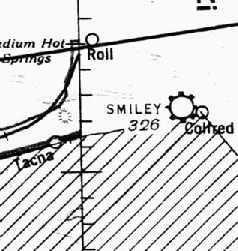 Smiley Field was no longer depicted at all on the 1965 USGS topo map nor the August 1971 Tactical Pilotage Chart (courtesy of Chris Kennedy). but according to David Brooks, DVR was located somewhat to the east of Smiley. Smiley Field was no longer depicted at all on the 1982 or 1988 USGS topo maps. 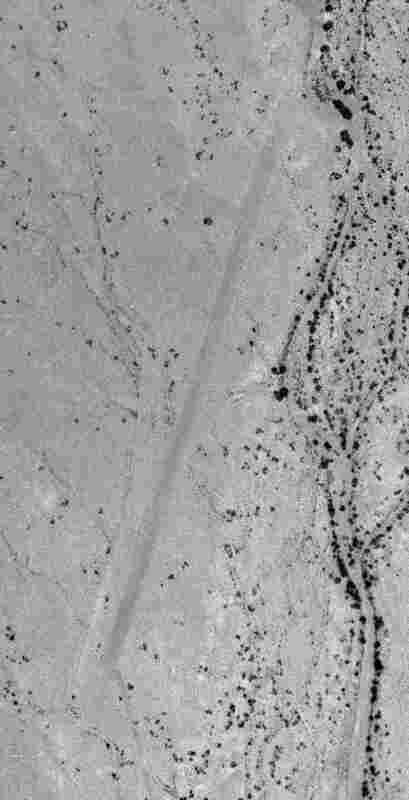 In the 1992 USGS aerial photo, not a trace appeared to remain of the former Smiley Field. A 2004 photo by Scott Thompson looking north-northeast at the remains of the runway pavement of Smiley Field. Scott reported, "I searched for the airfield & found a section of what I believe to be runway running in a roughly north-south direction. It appears to be macadam, or field-mixed asphalt, on a gravel bed. although the area isn't under active cultivation." (sandwiched between U.S. 80 & the railroad tracks) and the Colfred siding. As you can see in the photo, the laterals run along both sides of the runway. I forgot to measure the width of the runway, but estimate it to be 100' wide. (e.g., Wellton, Colfred, Stoval, etc.) during WW2 was generally 150'. part of the larger Wellton-Mohawk Division of the Gila Project. The canal & attendant laterals were constructed 1951-53." 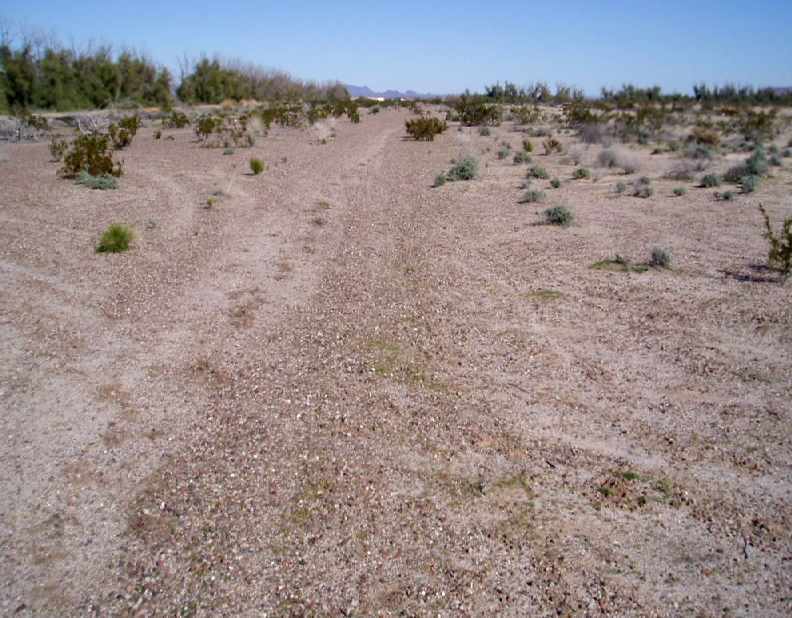 A 2004 photo by Scott Thompson looking South-southwest at the remains of the runway pavement of Smiley Field. but consistent with many of the other landing strips in the area. perhaps the outer edges of this section were lopped off to accommodate the construction of the irrigation laterals. The macadam surface is what leads me to believe this short section is all that remains of Smiley Field. 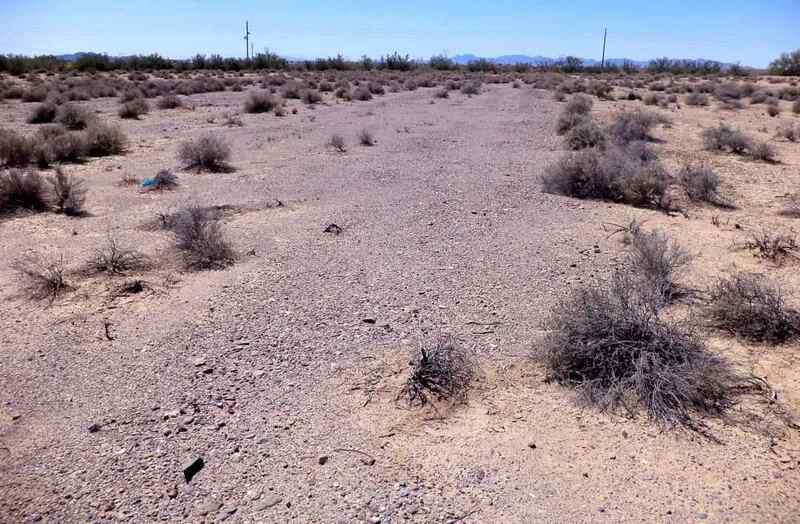 and Aux Fields 6-11 between Ajo & Gila Bend. and have yet to encounter a road section with this type of surface. by applying the macadam to handle the heavier wheel loads of military training aircraft. Included in the piles were large chunks of poured concrete that may represent the remains of a foundation. The structural debris could be associated with railroad activities." The site of Smiley Field is located east of the intersection of Route 80 & Avenue 42E. 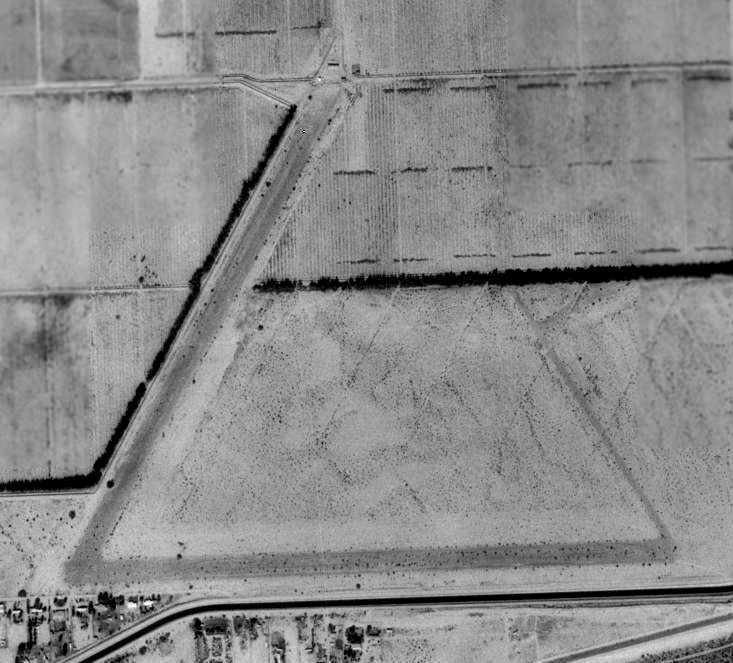 A 1996 USGS aerial view looking southeast at the Yuma Proving Ground North Airfield. 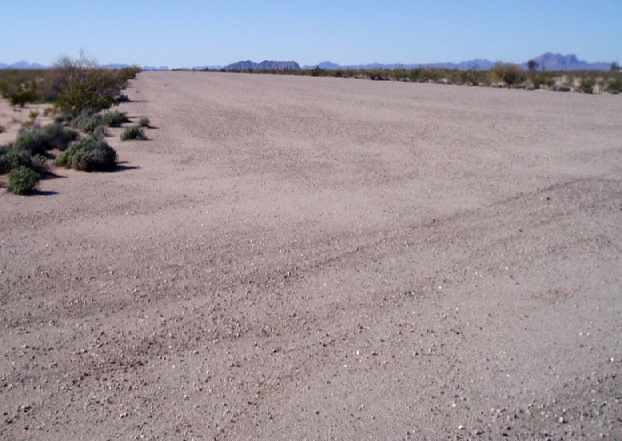 This dirt airfield is located in an extremely desolate northeast corner of the Army's huge Yuma Proving Grounds. it was never an airfield until it was constructed as a 'Small Austere Airfield' specifically for the C-17. 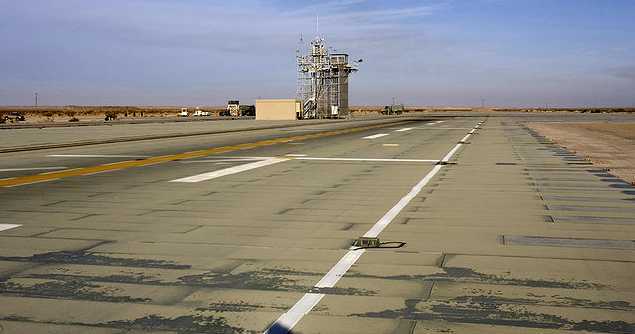 It has always been referred to as the 'C-17 Strip' & used to evaluate the aircraft performance on this dirt runway. It received a name by the SF troops who lost a man out there, but the local workforce never adopted the name. except for some early drug smugglers who used many of the malpais flats in the area. and no airfield was depicted at all on 2003 aeronautical charts, or USGS topo maps from 1969, 1981, 1986, or 1992.
and later used for C-17 testing." A 2003 photo taken from 16,000' looking southwest, by Bill Suffa (enhanced by Bil Grasha). along with the remains of an encampment or building foundations along the west side of the runway. 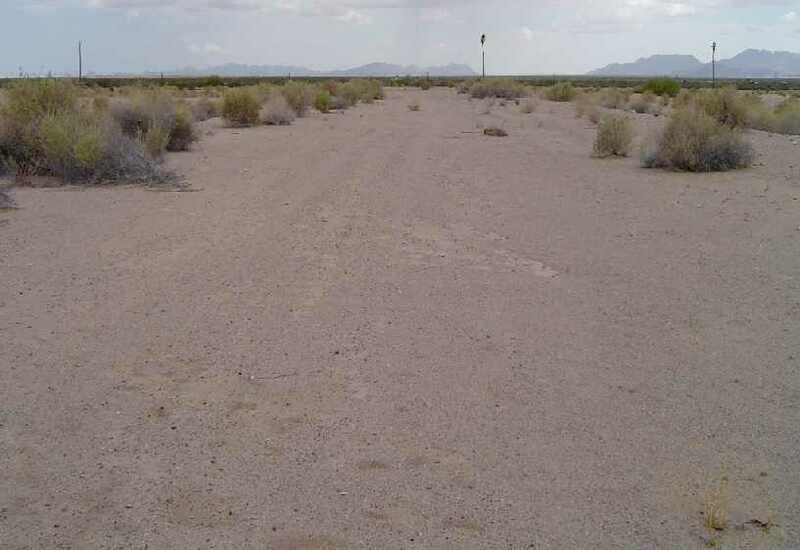 The Yuma Proving Ground North Airfield is located 4 miles west of Route 95, 40 miles northeast of Yuma. 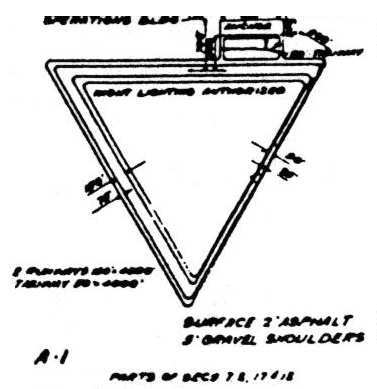 A January 1943 General Layout Plan of Dateland AAF. 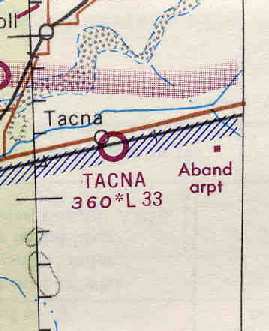 No airfield was yet depicted at this location on the 1930 USGS topo map. This field was established as a WW2 Army Air Corps training base. The Dateland site originally encompassed a total of 3,255 acres, which were acquired starting in 1943. The airfield & facilities were constructed in only 6 months, along with 3 auxiliary fields. 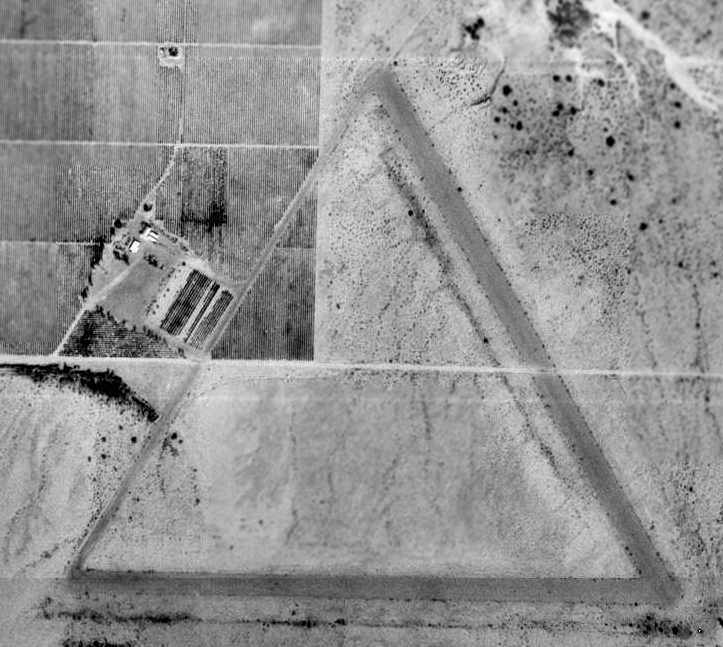 as an auxiliary field for the Yuma Aerial Flying School Gunnery Range. It eventually converted to B-25 bomber training. A total of 11,000 hours of flight training were logged at Dateland during WW2. gasoline station, water system, electrical distribution system, sewage disposal system & perimeter fences. and a parallel taxiway leading to a large concrete ramp on the south side. as a 3,200 acre irregularly-shaped property within which were 3 asphalt runways, the longest being the 6,598' NNE/SSW strip. However, the field was said to be inactive. The base was reduced to caretaker status in 1945. It was left with a contingent of 12 men & an officer to maintain the base. Note that it labeled the field as "Datelan AF" (with no 'd' at the end), described as having a 6,600' paved runway. 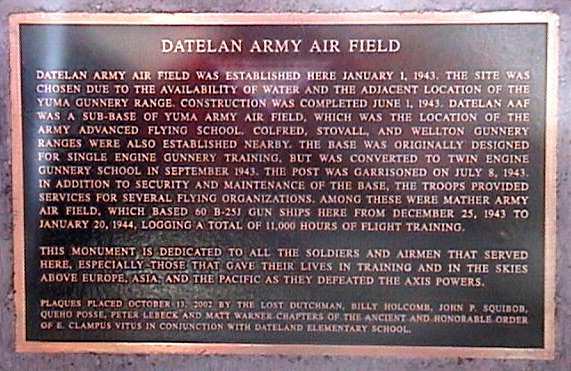 so the misspelling of “Datelan” may have been an attempt to distinguish between the 2 airfields. 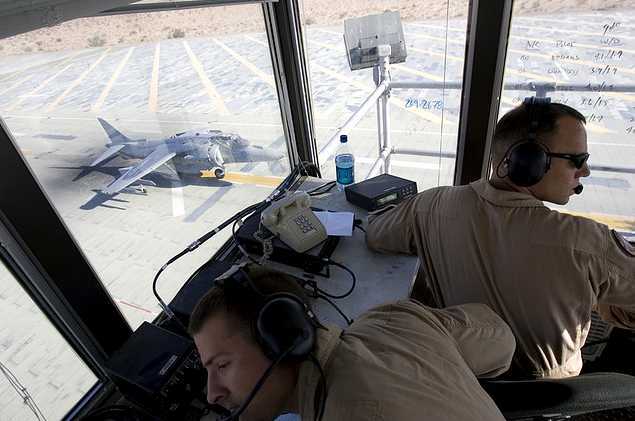 by various special forces squadrons of the MATS Air Resupply & Communications Service for training. showed a large number of unknown objects parked to the southwest of the ramp. and described the field as having a 6,500' hard-surface runway. In 1957 the hangar & the other flight line buildings mysteriously burned down. The military sent in an investigation team to do an inventory on the B-25 parts & found none. The officer was court-martialed & the base was closed permanently in 1957.
on the 1958 Phoenix Sectional Chart (courtesy of Chris Kennedy). The Dateland real estate was auctioned off in 1960 to private parties. and showed that the newly-constructed Interstate 8 had been built in between the control tower & the rest of the airfield. In 1970 the base was subdivided into 3,300 lots leaving the airport intact. One owner was going to subdivide the airport area into lots & build small lakes. "Dateland AF Aux" was labeled as "closed"
as that is how it was depicted on the December 1977 Phoenix Sectional Chart (courtesy of Ron Plante). It depicted Dateland as having 3 paved runways, with the longest being 6,500'. Another set of owners bought the Dateland property in 1995 to save the airport from extinction. taking advantage of the extensive airfield facilities abandoned by the military. and a concrete ramp area big enough to park 300 planes. A motel & a museum were among the planned attributes. 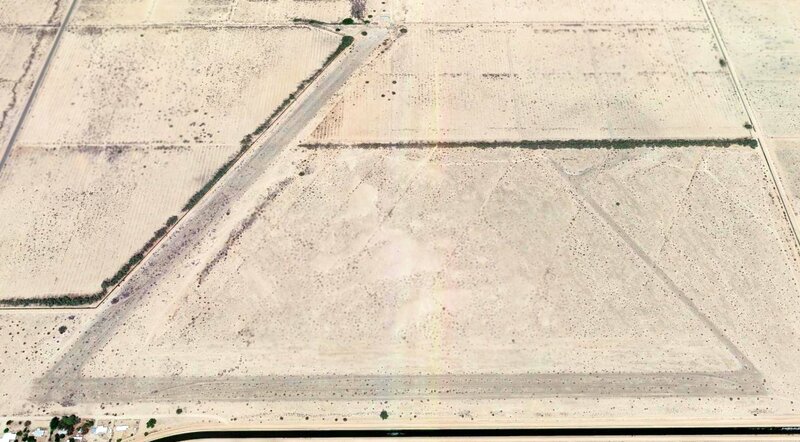 As seen in a 1996 USGS aerial view looking north, Dateland's 3 runways still remained (6/24, 16/34, and the longest - 1/19, 6,600' long), along with a large concrete ramp area. 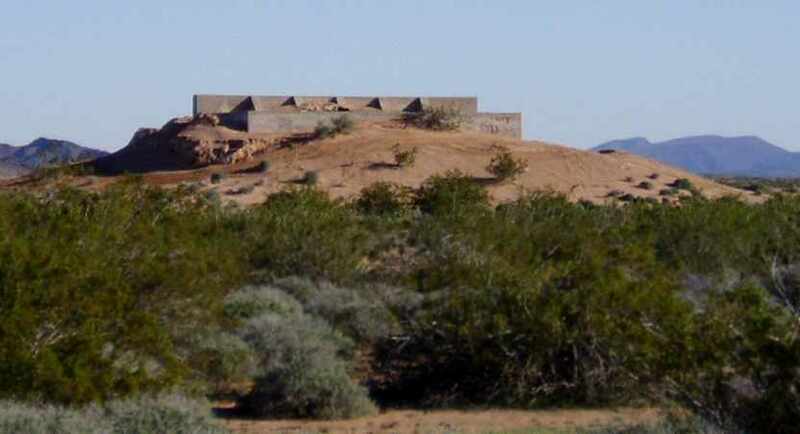 The only building remaining was a sand-filled concrete bunker previously used to sight the machine guns of the B-25 Mitchell bombers. were superimposed over the 1996 USGS aerial photo of the area. A 1997 aerial view by Steve Hoza, looking north at the Dateland airfield. Steve Hoza reported, "I phoned Luke AFB to get permission to fly into the Ajo corridor, which is normally off limits (it's a MOA). Getting permission was simple & we flew on a Sunday when they weren't doing any flying. After 9/11 I am sure it would be next to impossible to get that same permission." 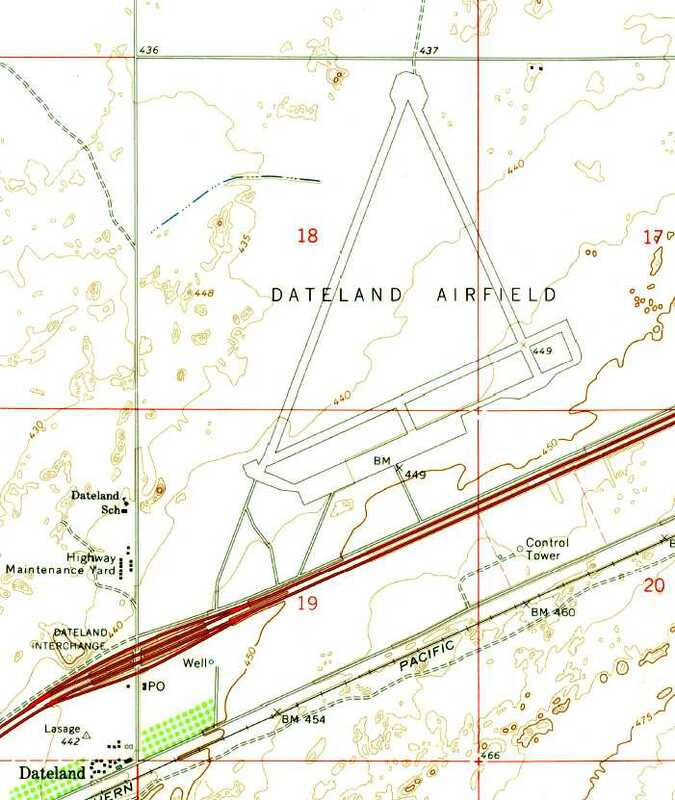 The Dateland airfield was once again added to the Airport Facility Directory in 2000 as a new private airfield. The developer intended to make the field public, and hoped to attract an FBO. about 100' southeast of the restaurant at Exit 67 on Interstate 8, commemorating “Datelan Army Air Field”. the pavement looked pretty fresh, and the parking area appeared to have revetments or tie downs. It looked huge! Very wide runways." 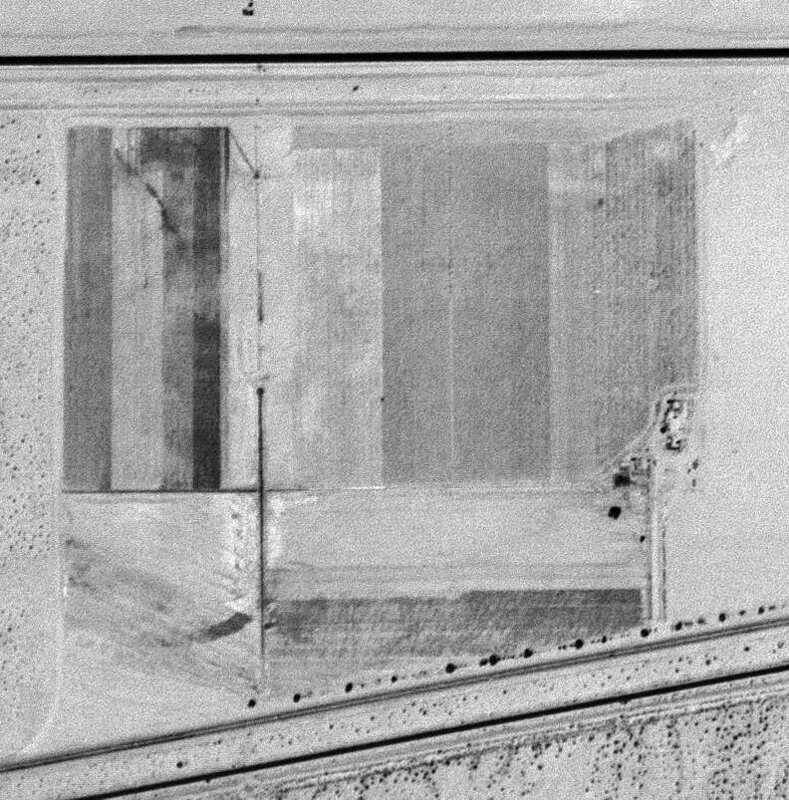 A June 2004 aerial photo by Dwight Furleigh (enhanced by Bill Grasha), looking southeast at the Dateland airfield. Dwight Furleigh visited the Dateland airfield in 2004. Unfortunately, he found that the commercial venture to reopen Dateland as a residential airpark had evidently failed. and it was boarded up & abandoned, which indicates this venture must have peetered out. but did drive up to the North end of the main runways & took some photos. The runways look to be in good shape, but no activity in terms of airplanes was seen. 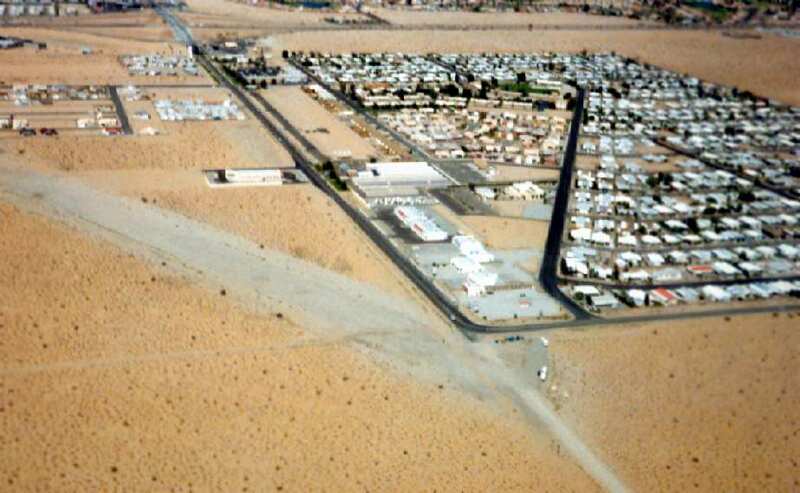 There are small low-income homes & trailers in the desert to the north & east of the base. I read on the plaque near the other Dateland plaque at the south side of the Interstate at the restaurant." 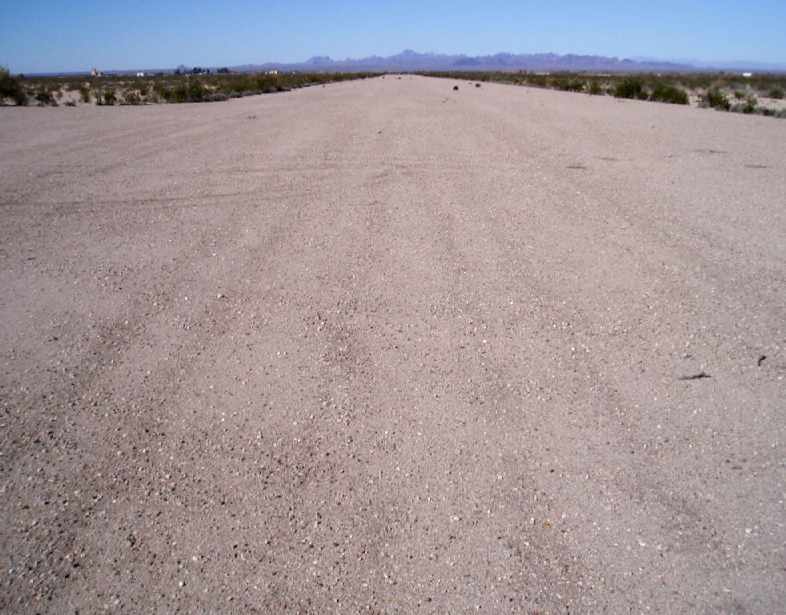 A 2004 photo by Dwight Furleigh, looking southeast along Dateland's southeast/northwest runway. 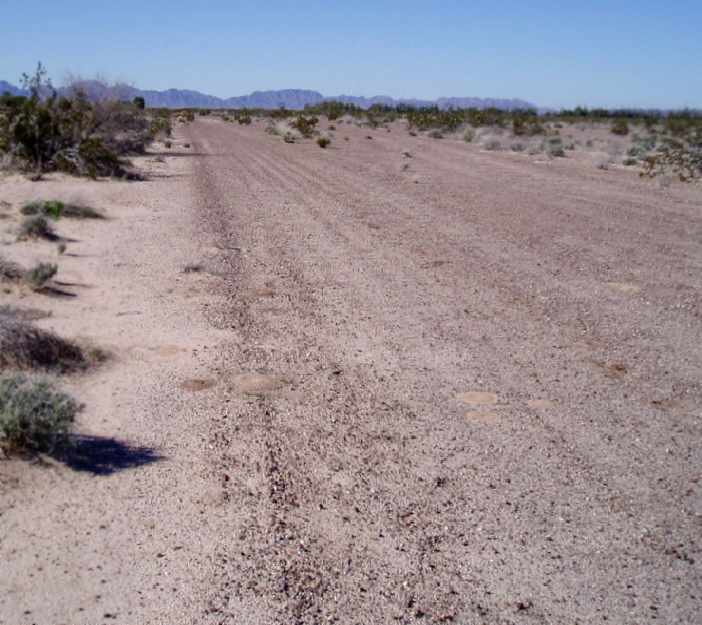 A 2004 photo by Dwight Furleigh, looking southwest along Dateland's southwest/northeast runway. but was too far away to see the details." previously used to sight the machine guns of Dateland's B-25 Mitchell bombers. It is located just west of the southwest corner of the airfield. Jim Stewart reported in 2011, “Stoval & Datelan see a fair amount of use, mostly at night for Special Ops training. That's why they appear to be so well maintained. As of 2011, street maps depict a network of dozens of streets laid out around the airfield, many with aviation-themed names. However, the vast majority of these streets are devoid of houses or any other construction. 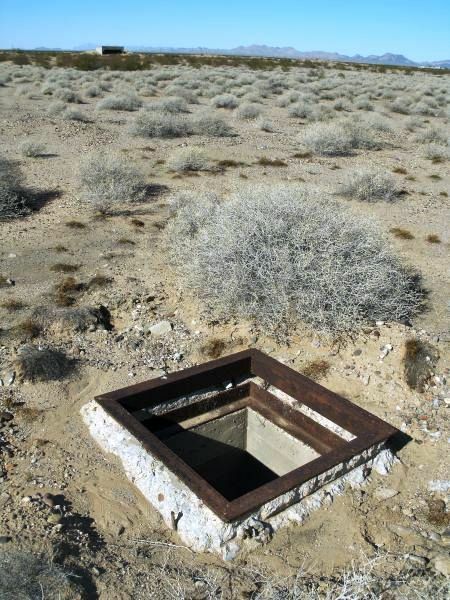 A February 2012 photo by Andy Gulley of a Dateland bunker previously used to sight the machine guns of Dateland's B-25 Mitchell bombers. 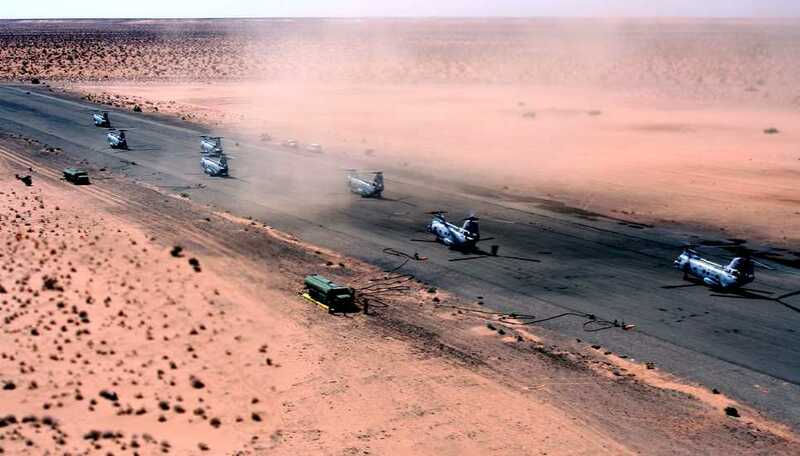 A February 2012 photo by Andy Gulley of his radio-controlled T-28 Trojan model aircraft flying over the remains of the Dateland runways. Andy reported, “The runways are slowly degrading but still useable. 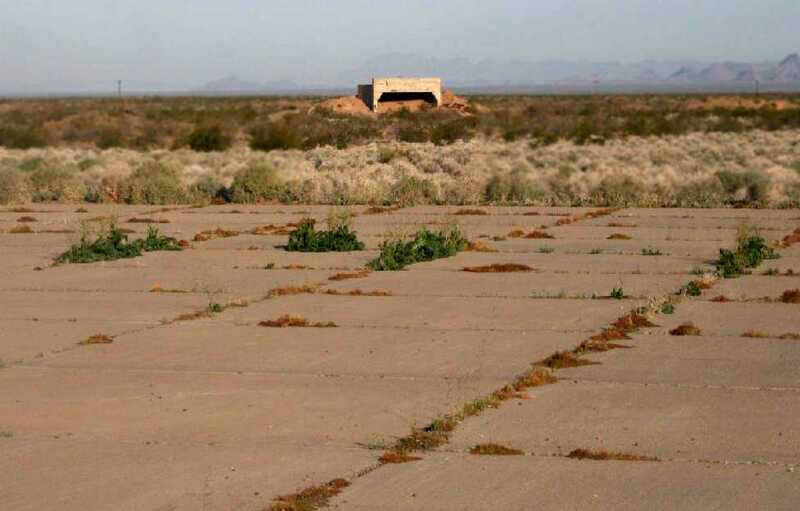 Douglas Johnson reported in 2012, “Dateland Airfield... I live in the house just off a runway & I own about 2,000 lots in the area. In February I was building roads & taxiways to lots. I own about 150 lots with taxiways to the lots. Mr. McHenry owns about 200 with taxiways to those lots + 640 more lots. Francis Blake reported, “On 5/7/15 I stopped at Dateland for a quick inspection of the WWII airfield. A November 2015 photo by Mike Jamison of the Dateland AAF ramp. A November 2015 photo by Mike Jamison of a “Trap door accessing Dateland's underground water supply & sewage. A 2016 aerial view looking north showed Dateland's 3 massive runways still remained intact, along with a large concrete ramp area. 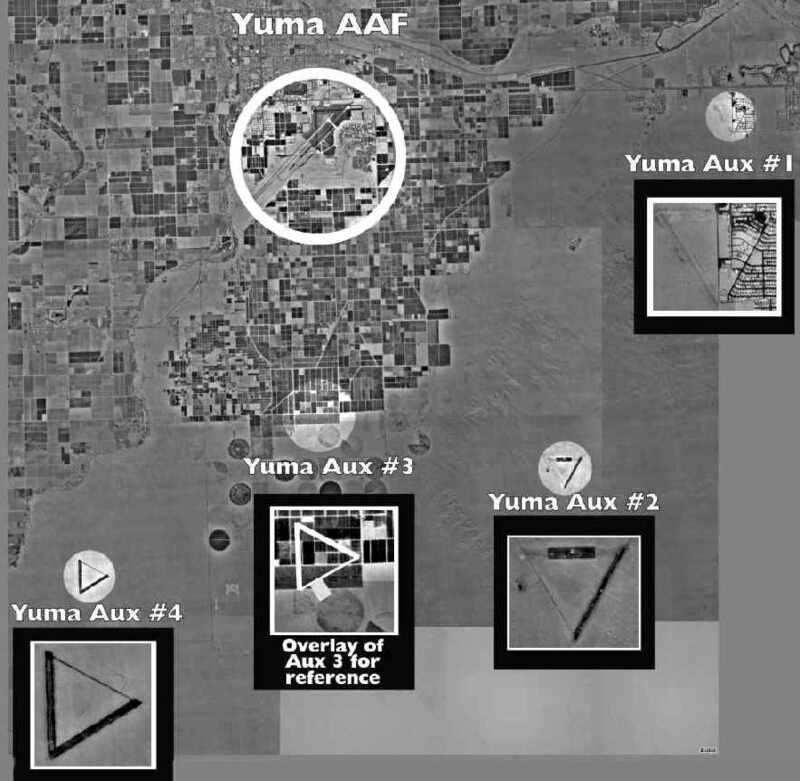 depicted “Yuma Army Air Field Auxiliary (Stoval Ground Gunnery Range)” as having 2 asphalt runways. which conducted primary flight training & training of bomber aircrews. and an asphalt ramp on the northeast side. as having 2 asphalt 4,000' runways, oriented northeast/southwest & east/west. 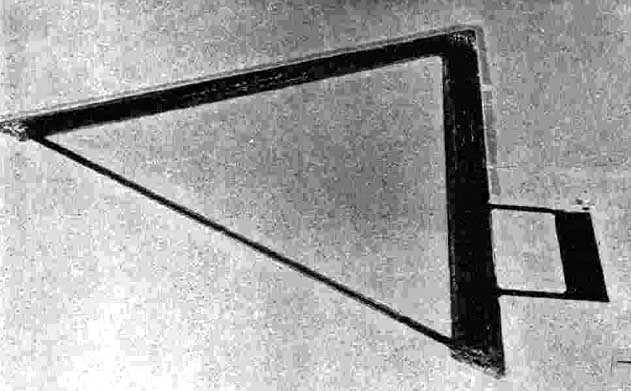 The field was reported as having any hangars. 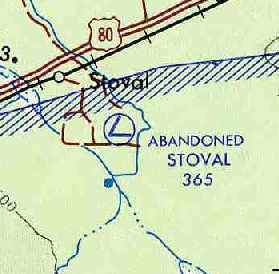 Stoval was described as being operated by the Army Air Forces, but inactive. which described the field as being unattended, and the longest runway as being 3,800'. 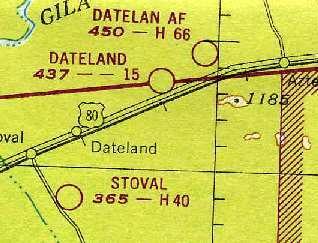 as Stoval Airport was depicted as a private field on the 1955 Phoenix Sectional Chart (courtesy of John Voss). as having 2 asphalt runways (the longest being 4,000'). 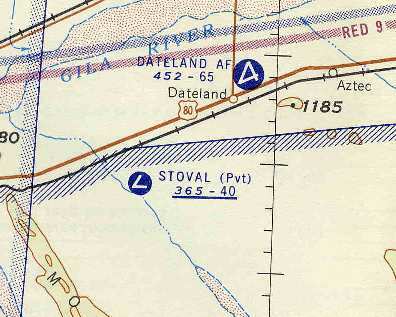 Stoval was still depicted as a private airfield on the 1958 Phoenix Sectional Chart (courtesy of Chris Kennedy). 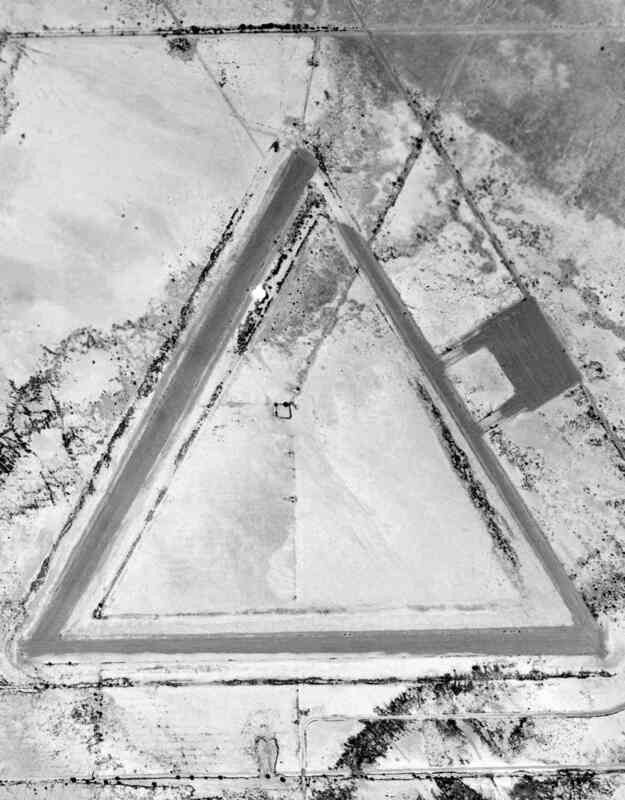 A 9/30/61 USGS aerial photo showed the remains of three 4,000' paved runways & 2 paved ramps at Stoval. 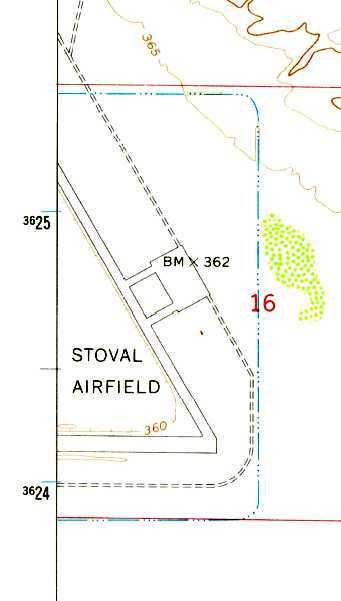 The 1965 USGS topo map depicted “Stoval Airfield” as having 2 runways & a connecting taxiway. as it was labeled "abandoned" on the August 1971 USAF Tactical Pilotage Chart (courtesy of Chris Kennedy). 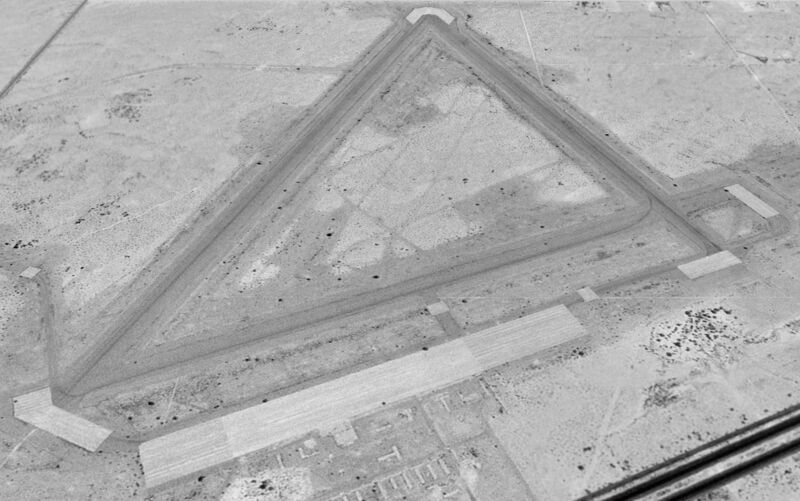 The 1996 USGS aerial photo showed the remains of three 4,000' paved runways at Stoval. Interestingly, a 2nd paved ramp (on the west side) had been added (for what purpose?) at some point between 1961-96. A 2004 photo by Dwight Furleigh looking southeast at the Stoval airfield. A 2005 photo by Dwight Furleigh looking southwest from the midpoint of Stoval's northeast/southwest runway. 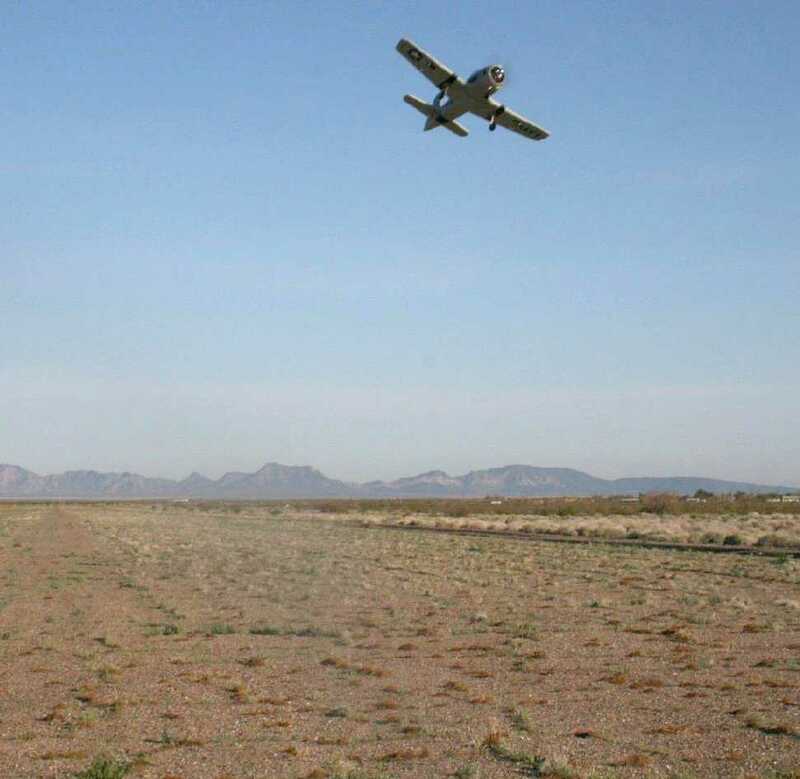 Dwight reported: “This airfield is on the Barry Goldwater Range and is at the end of the old Highway 6 miles east of Dateland. This road is from the 1950s and was used before Interstate 80 was built - now it isn't even maintained by the county. There is a short unmaintained road to the base itself. There is a row of porta-potties sitting in the middle of the desert so apparently some visits do occur there. so perhaps it is used for practice landings. 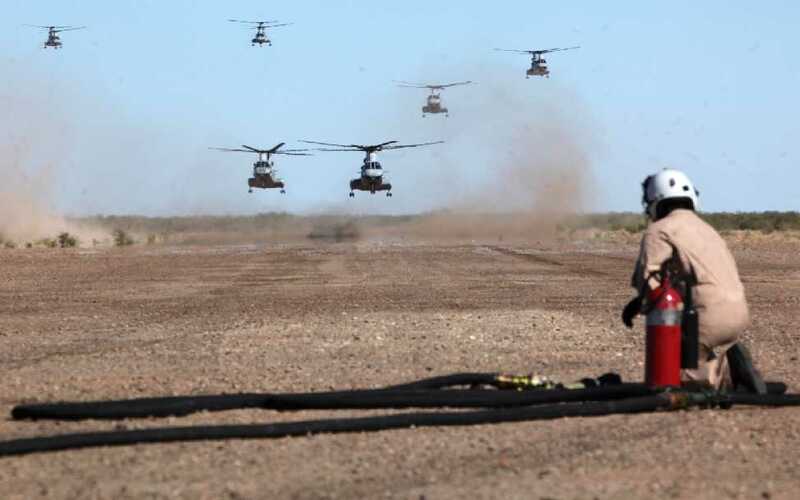 A 10/9/09 DoD photo by Benjamin Reynolds of 6 Marine Corps CH-46 Sea Knight helicopters landing at Stoval Airfield. as part of a training mission for Weapons & Tactics Instructor Course 1-11, which is hosted by Marine Aviation & Weapons Tactics Squadron 1.
running fuel lines from a KC-130 Hercules to refueling points at Stoval Airfield. which is hosted by Marine Aviation & Weapons Tactics Squadron 1. Stoval is located along Interstate 8 between Yuma & Phoenix. 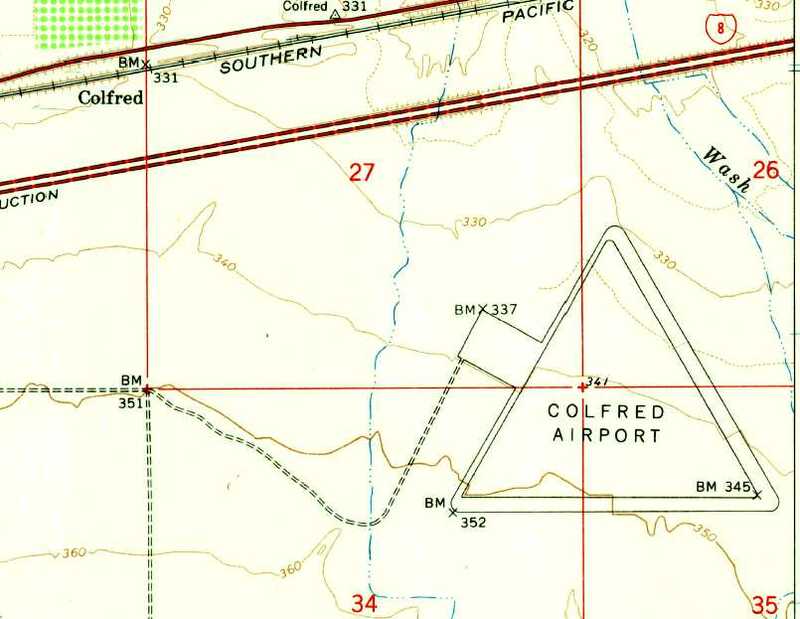 “Colfred Airport”, as depicted on the 1965 USGS topo map. which was a WW2-era undeveloped range used for small arms training. to support the training activities at nearby Yuma Army Airfield. The Colfred Airfield was deactivated by the military at some unknown point after WW2. 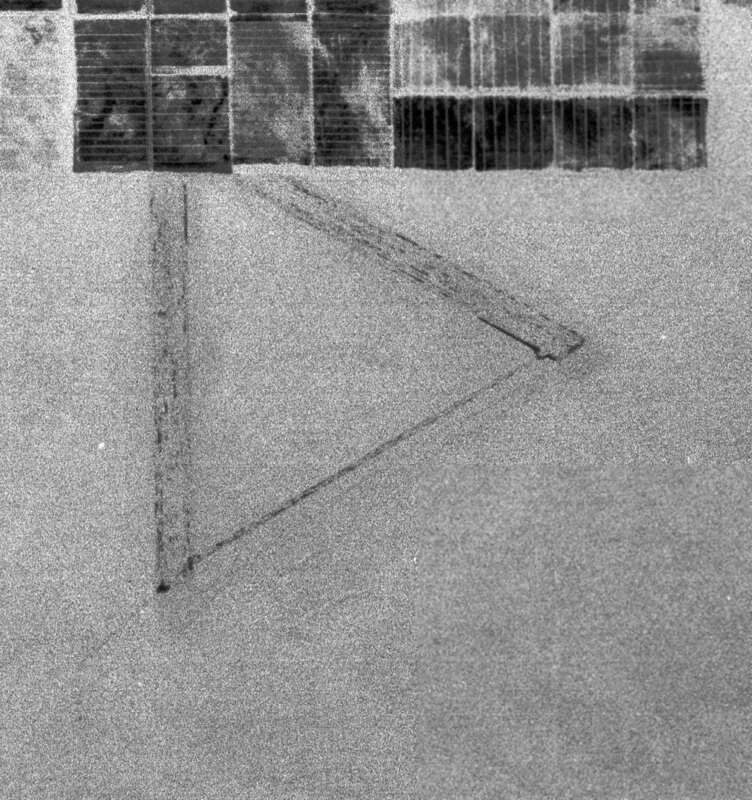 The earliest photo which has been located of the Colfred Airfield was a 6/19/53 USGS aerial view. It depicted Colfred as having two 4,200' runways & a ramp on the west side. At some point between 1945-55 the Colfred airfield was reused as a civilian airport. 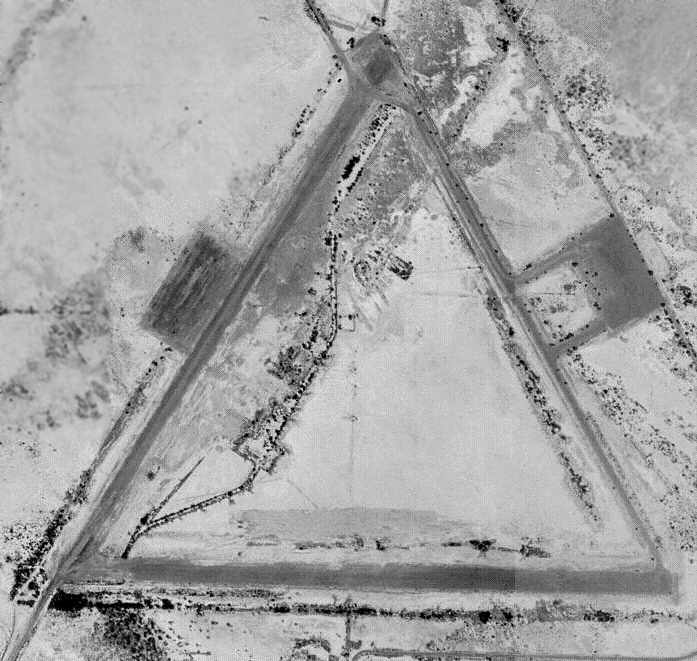 depicted Colfred as a civilian airfield with a paved 4,000' runway. a facility for the construction of a remote operational control site for Q-2 drone aircraft (the original version of the Ryan Firebee). access road improvements & a power generation plant. The Colfred Operations Control Annex site was declared surplus in 1961.
and a paved ramp on the northwest side. By the time of the 1966 San Diego Sectional Chart (courtesy of Chris Kennedy), the Colfred airfield was labeled as "Aband arpt". Greg Nelson (of Yuma County Planning & Zoning) reported that he visited & spoke with the airfield property owner, Gary Waggoner. at that point the Colfred site was owned by 3 private individuals, and none of the original military buildings remained. 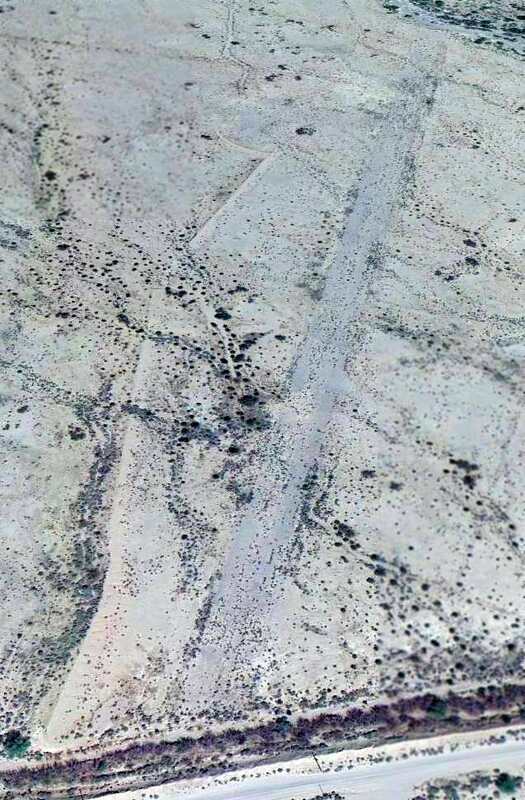 The remains of three 4,200' runways were still barely perceptible in the 1992 USGS aerial photo. The western portion of airfield was evidently being used for farming. Douglas Bell reported in 2004, "I was in the area last February . 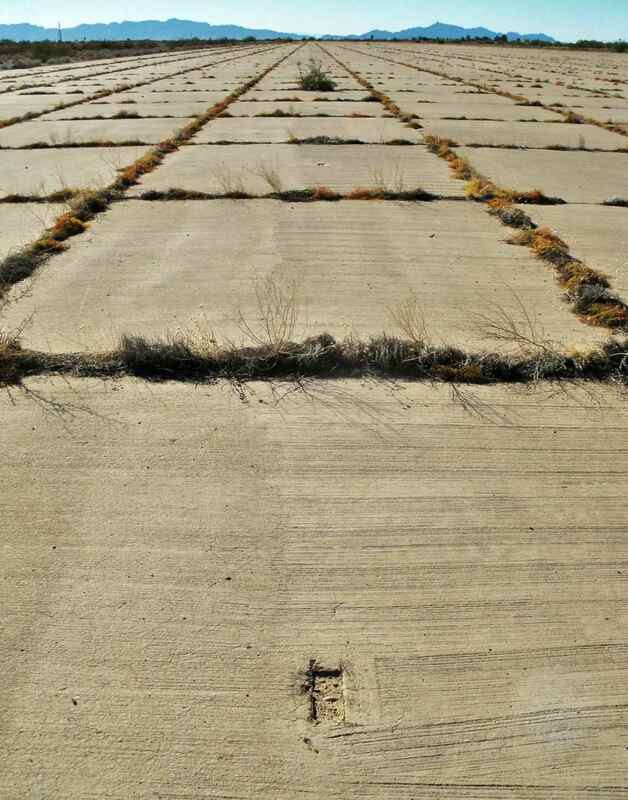 and now the plants are all dead but the runways are still there in fair condition." A 2004 photo by Dwight Furleigh looking northwest along the northwest/southeast runway. as it was about 5 miles east of the exit for Tacna, AZ, down a sand road & pretty primitive. It is only about 1/2 mile from the interstate highway but very hard to see from it unless you know what you are looking for." He found the northeast/southwest runway to be "narrower than he rest but still clear & usable if needed." 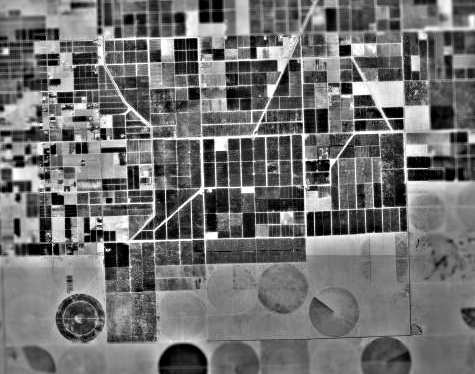 The northern portion of this was "where crops had been planted some time ago but appear to not be used anymore." The northwest/southeast runway was "very wide & appears to still be well maintained." The east/west runway was "also in good shape." A 2004 photo by Dwight Furleigh looking west along Colfred's east/west runway. A 2004 photo by Dwight Furleigh looking northeast at the Quonset huts & trucks on the site of Colfred's former ramp area. It is not clear if the Quonset huts dated from the site's airfield days, or if they were added later. There was no sign of any aircraft. 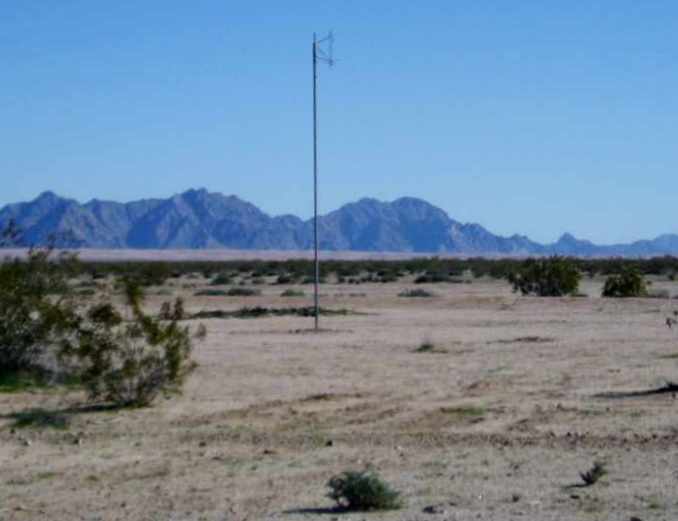 A 2004 photo by Dwight Furleigh looking southeast at the windsock pole which remains standing in the middle of the field at Colfred. A 2004 photo by Benjamin Russell, taken from a commercial airliner looking south at the Colfred airfield. that “property containing a portion of the Colfred Airfield is the subject of a rezoning application. I recently visited the property & spoke with the owner, Gary Waggoner. Mr. & Mrs. Waggoner own 60 acres on which the apron area & a portion of the taxiway were located. I asked Mr. Waggoner about the condition of the runways. He said they are in good shape under about 6 inches of sand. deliberately covered the airfield with sand to protect it from the sun. An April 2014 photo by Mike Jamison, of “part of the airfield's perimeter berm; a dirt wall that surrounds most of the field. Shown here is a section of the wall's west side. I guess having such a barrier could harm descending aircraft. Nevertheless, I can't figure out what else the berm could have been. 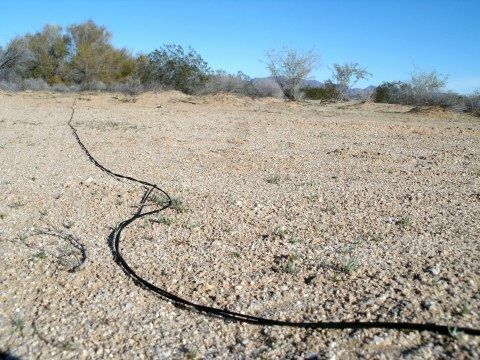 An April 2014 photo by Mike Jamison, of “a length of communication wire found near Colfred's south runway. Cloth insulation probably means the wire is pretty old. I've seen similar lengths, strung for thousands of feet in and around Wendover Army Airfield. 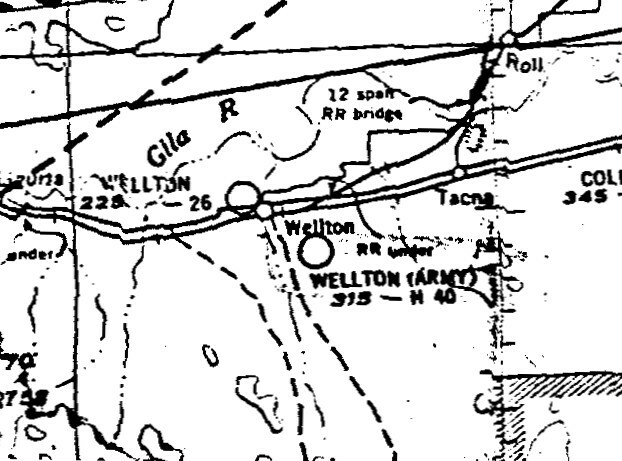 “Wellton (Army)” Airfield, as depicted on the March 1948 San Diego Sectional Chart (courtesy of Ron Plante). 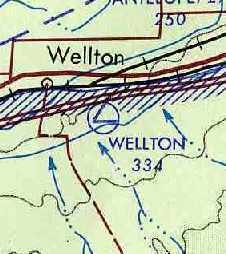 According to the Bureau of Land Management, the Wellton airfield was used starting in 1943. 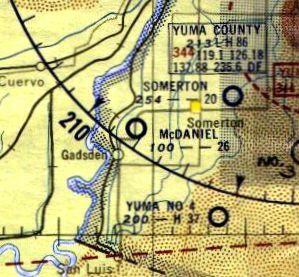 No airfield at this location was yet depicted on San Diego Sectional Charts from 1943, 1944, and 1945. 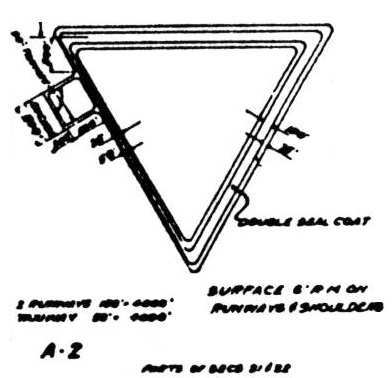 The earliest depiction which has been located of the Wellton Airfield was on the March 1948 San Diego Sectional Chart (courtesy of Ron Plante). It depicted “Wellton (Army)” Airfield as having a 4,000' paved runway. but that may have been specifically the end of its military use. It described the field as having 2 bituminous runways (the longest being 4,000'). 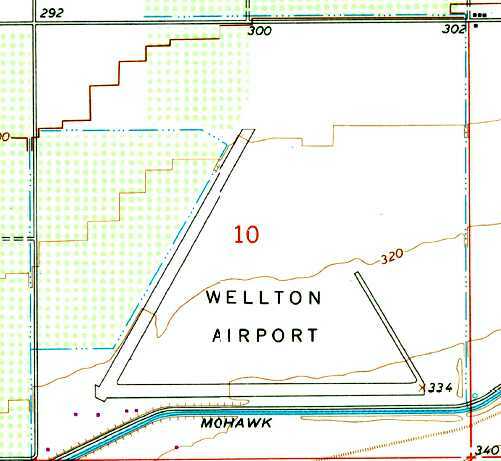 The 1965 USGS topo map depicted “Wellton Airport” as having 2 runways & a taxiway, with a gap in the taxiway on the northeast side. 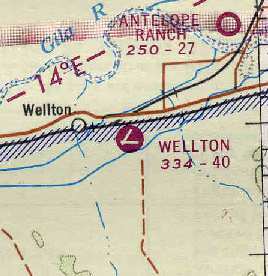 Wellton was still depicted as an active airfield on the 1966 San Diego Sectional Chart (courtesy of Chris Kennedy). Wellton Airport was apparently closed at some point between 1971-92. 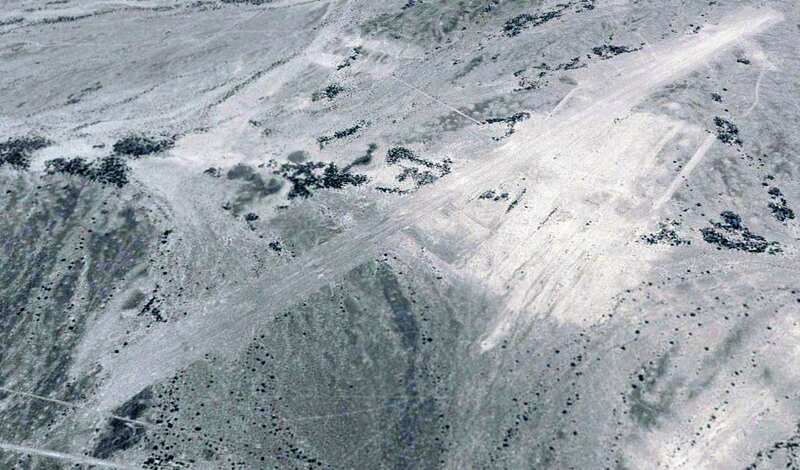 The remains of the two 3,700' runways & connecting taxiway were still barely perceptible in the 1992 USGS aerial photo. A December 2004 photo by Dwight Furleigh looking west along the remains of Wellton's east/west runway. 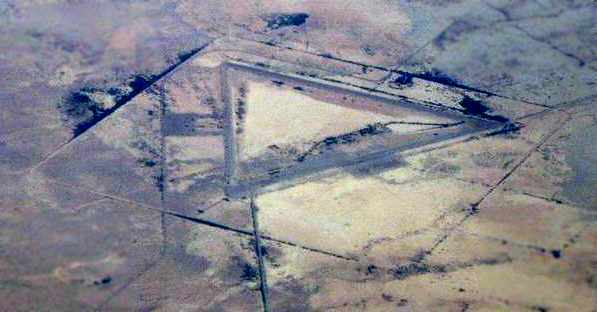 Dwight reported, "I visited Wellton AAF field & others in the Yuma area in December 2004. This airfield has fallen into complete disuse. The runways are made of pea gravel & scrub brush has grown up over much of the area. There is the usual empty beer bottles & trash in the area, but the runways are indeed still identifiable as you can see." A December 2004 photo by Dwight Furleigh looking northeast along the remains of Wellton's northeast/southwest runway. A December 2004 photo by Dwight Furleigh of "old rusting debris that looks to be associated with aircraft, but was unable to identify them." A 2016 aerial view looking north at the site of Wellton Field shows the remains of 2 runways & a connecting taxiway. The outline of a parking ramp on the east side of the taxiway is barely recognizable. three miles southeast of the town of Wellton. 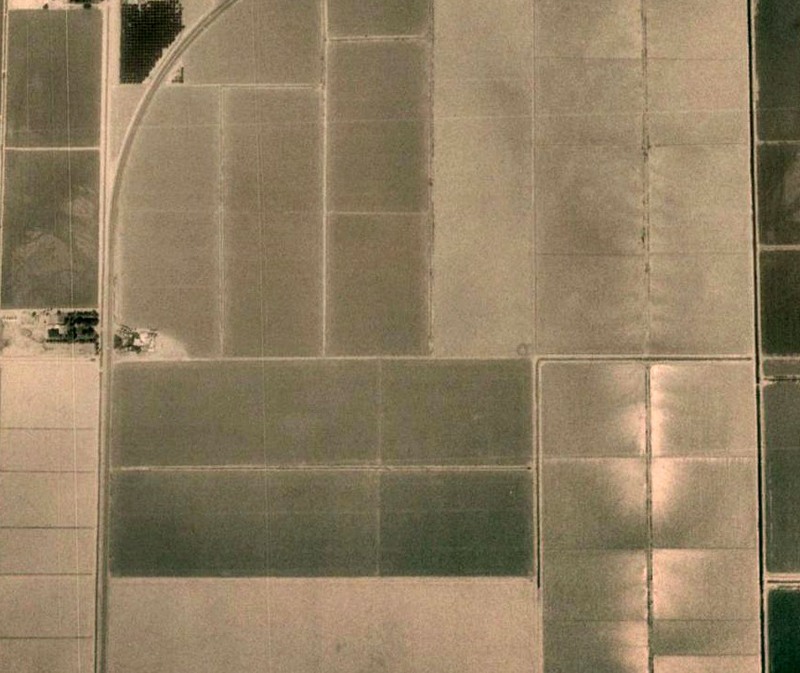 A 6/23/43 aerial view looking west at Yuma Aux #1 from the 1945 AAF Airfield Directory (courtesy of David Brooks). 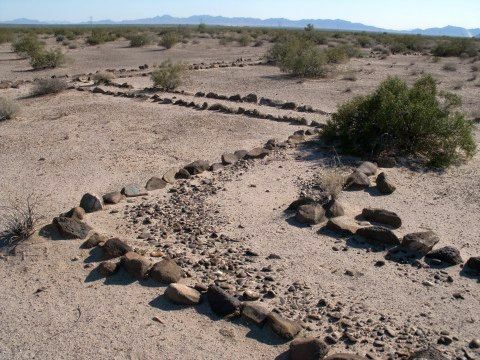 The date of construction of Yuma Aux #1 has not been determined. was a 6/23/43 aerial view looking west from the 1945 AAF Airfield Directory (courtesy of David Brooks). 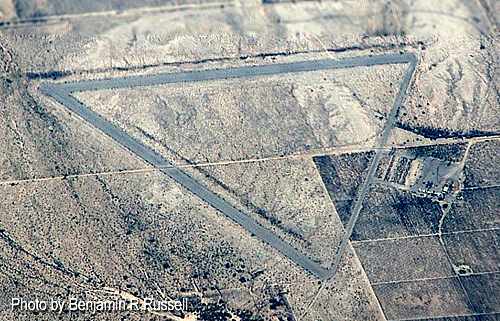 It depicted Yuma Aux #1 as having 2 asphalt runways connected by a taxiway, and a ramp on the north side. 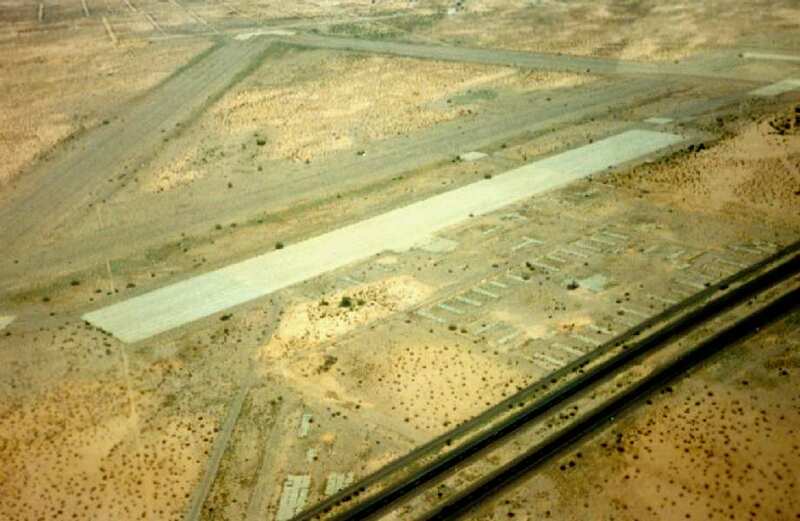 depicted Yuma Aux #1 as having 2 asphalt runways connected by a taxiway, and a ramp on the north side. It described the field as having 2 bituminous runways (the longest being 3,740'). 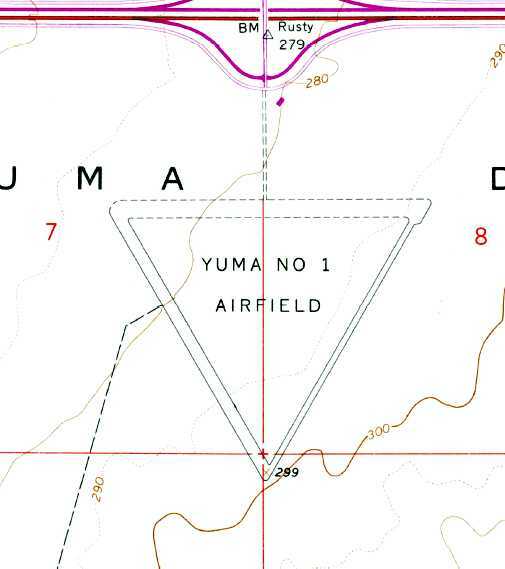 The 1965 USGS topo map depicted “Yuma #1 Airfield” as having 2 runways connected by a taxiway. and the large concrete structure across Fortuna Road. have been reused as streets of a residential neighborhood. and the former northeast/southwest taxiway is now South Mesa Drive. with the remains of the western portion of the runways still plainly apparent. 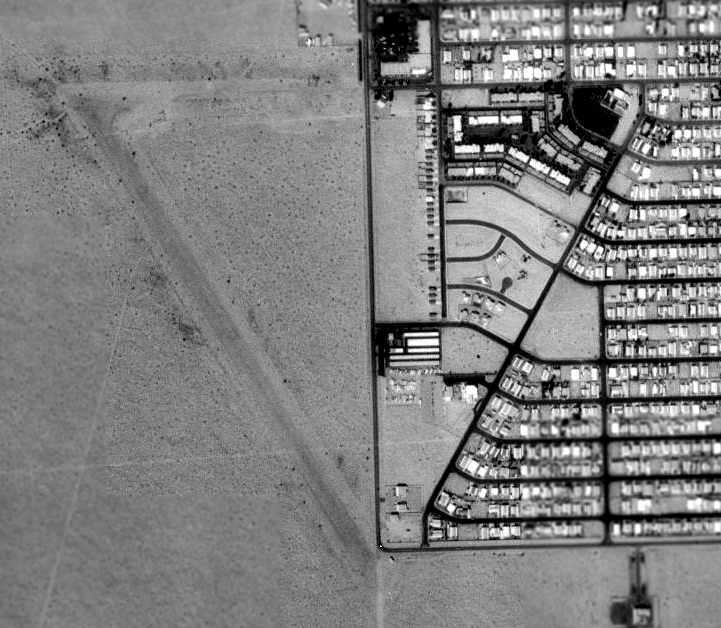 over the 1994 USGS aerial photo, showing their location relative to the former Yuma AAF (the present-day MCAS Yuma). 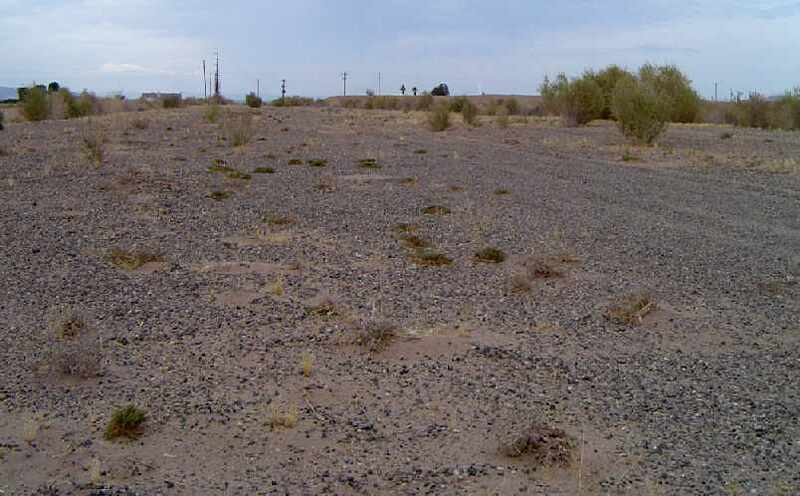 looking northeast at Yuma Aux #1. The former airfield is located south of the intersection of Interstate 8 & South Fortuna Road. 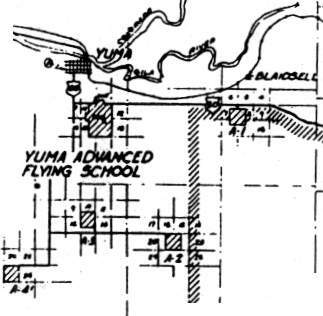 from a 1944 Army map of the Yuma Advanced Flying School & its surrounding fields (courtesy of John Voss). It is located within the present-day Barry Goldwater Air Force Bombing Range. 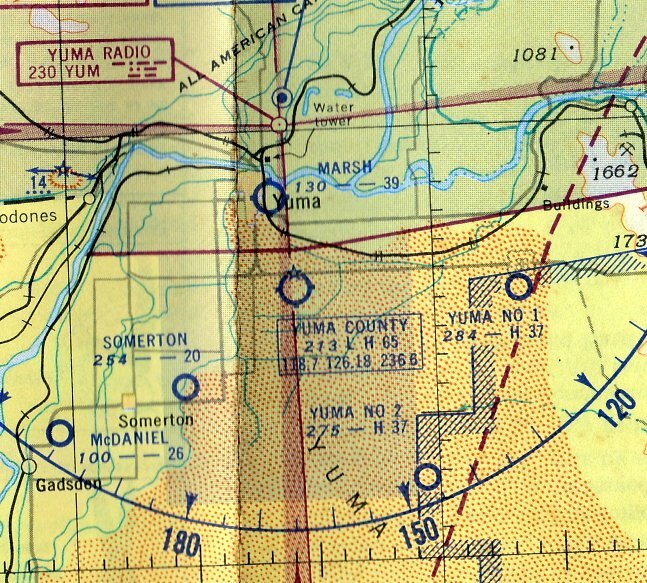 The 1965 USGS topo map depicted 2 runways & a connecting taxiway at Yuma Aux #2, but without any labeling. 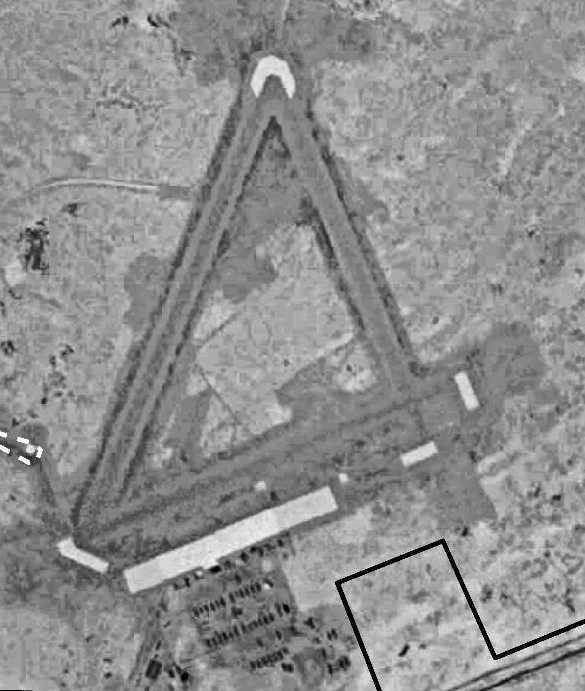 along with a taxiway connecting the runways on the western side, forming an equilateral triangle. What was formerly the taxiway has now been reused as a portion of a road, E County 19th Street. Remains are visible of the parking apron, west of the taxiway. 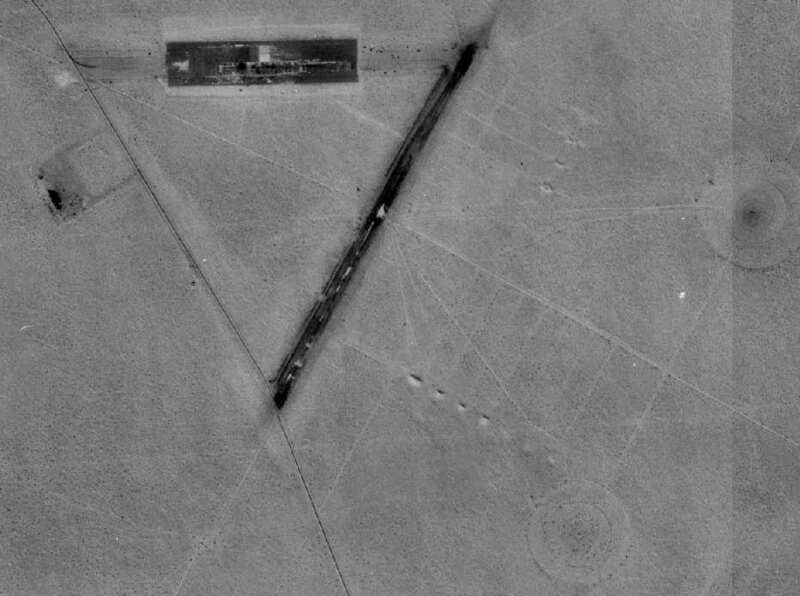 Two bombing range target circles are visible adjacent to the airfield to the southeast. and the area to the southeast is all firing range for ground units deployed to Yuma. seen at Yuma Aux #2 while conducting shipboard operations practice, prior to a deployment. the signal for the maintenance guys to refuel the aircraft. rather than having to make the trip back to Yuma. Yuma Aux #2 is very much still in service. according to Brandon Ball (former avionics technician with Yuma Marine Attack Squadron 513). and upon it has been painted the outline of an LHA-class amphibious assault ship. AV-8B Harrier pilots from Yuma come to Yuma Aux #2 to make practice landings on the LHA outline. without the costly expense of flying to an actual ship. & a realistic lighting system for night operations. Aux #2's "ship" has also been used in the past for Harrier squadron deployments. while pretending to operate from a ship. The future of Aux #2 isn't certain. While a valuable training aid, it occasionally closed in the past due to instances of foreign object damage (FOD) to Harrier engines. which the Harrier ingested upon touchdown. a 5 hour affair that was accomplished in the middle of the night. Luckily, a Harrier is small enough to pass under streetlights & stoplights. 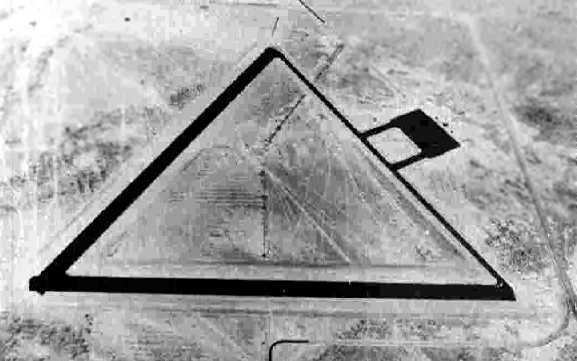 which has been built over the east/west runway at the Yuma Aux #2 airfield. 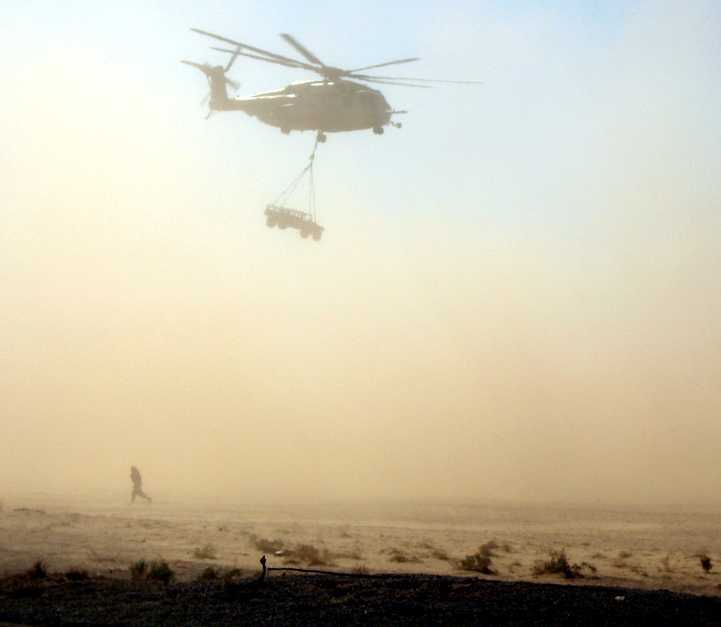 A 10/7/06 photo of a Marine CH-53E lifting a HUMVEE from Aux #2. A 10/16/06 aerial view of 7 CH-46 Sea Knights lined up at Yuma Aux #2's Forward Arming & Refueling Point. with a Harrier moving down the tram line during VMA-211's Field Carrier Landing Practice at Yuma Aux #2.
for Field Carrier Landing Practice before going out to the boat, USS Tarawa LHA-1. The Aux #2 landing surface is made of AM-2 matting, and the tower out of heavy duty scaffolding structure. 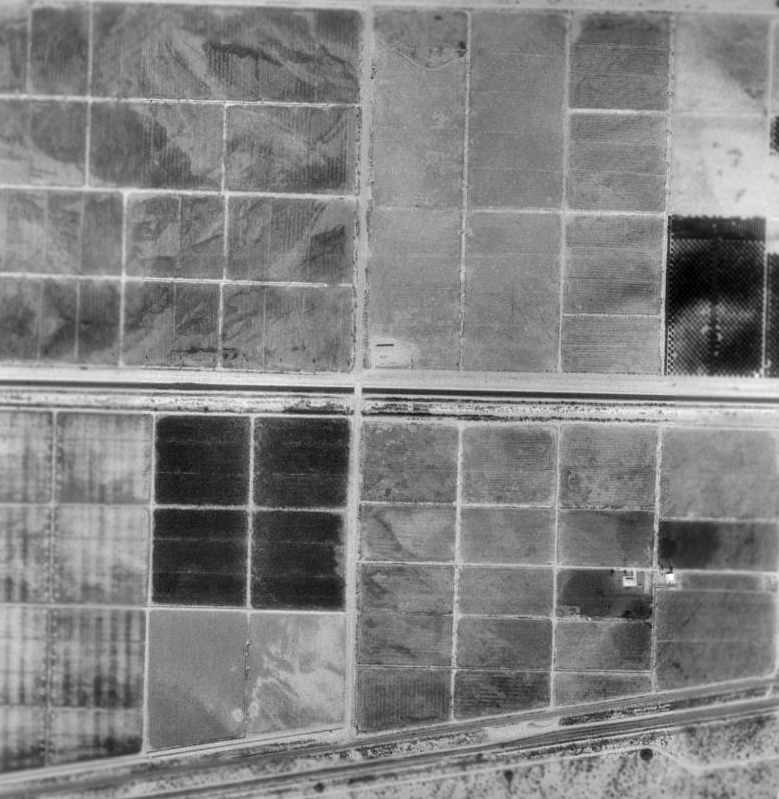 A 6/23/43 aerial view looking southeast at Yuma Aux #3 from the 1945 AAF Airfield Directory (courtesy of David Brooks). to support training operations at Yuma Army Airfield. 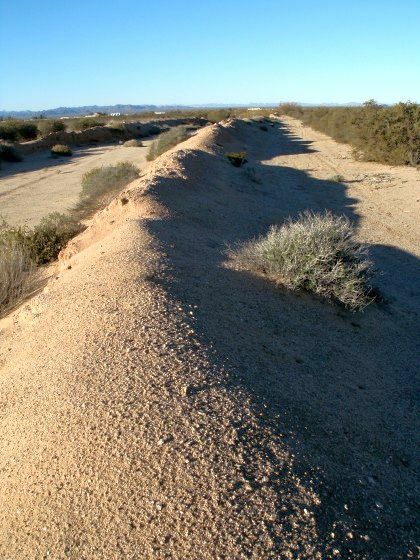 The date of construction of Yuma Aux #3 has not been determined. was a 6/23/43 aerial view looking southeast from the 1945 AAF Airfield Directory (courtesy of David Brooks). 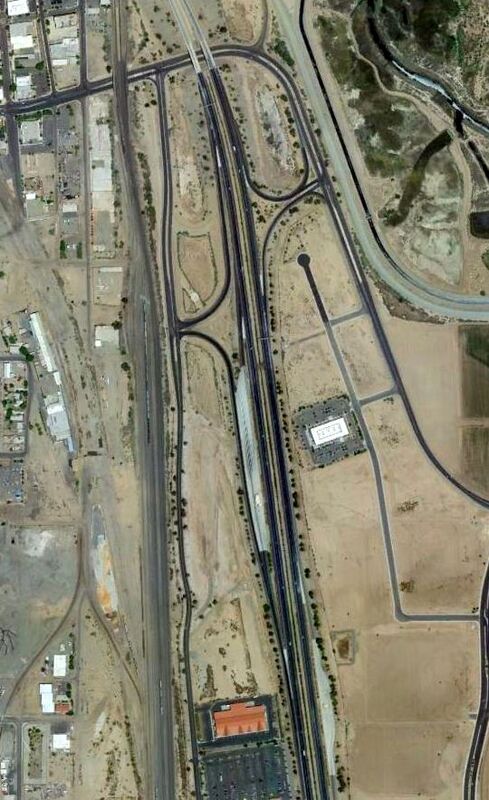 It depicted Yuma Aux #1 as having 2 asphalt runways connected by a taxiway, and a ramp on the south side. 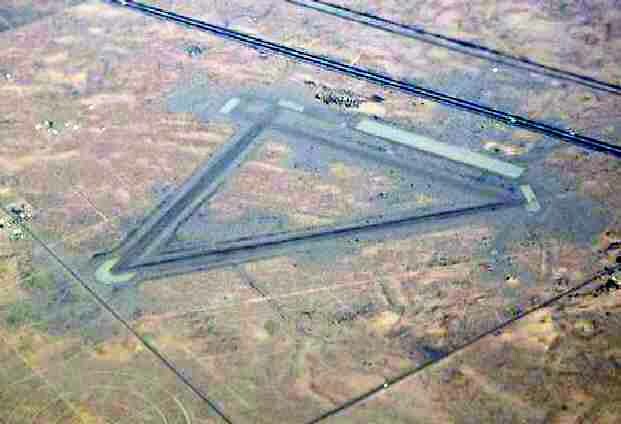 with 2 paved 4,000' runways & a taxiway forming an equilateral triangle. A ramp area with an operations building was south of the taxiway. 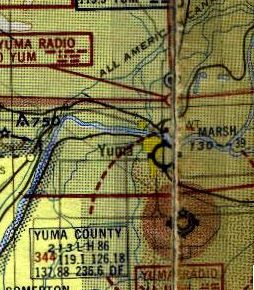 As depicted on a 1944 Army map of the area of the Yuma Advanced Flying School (courtesy of John Voss). and was described as having a 4,000' runway. 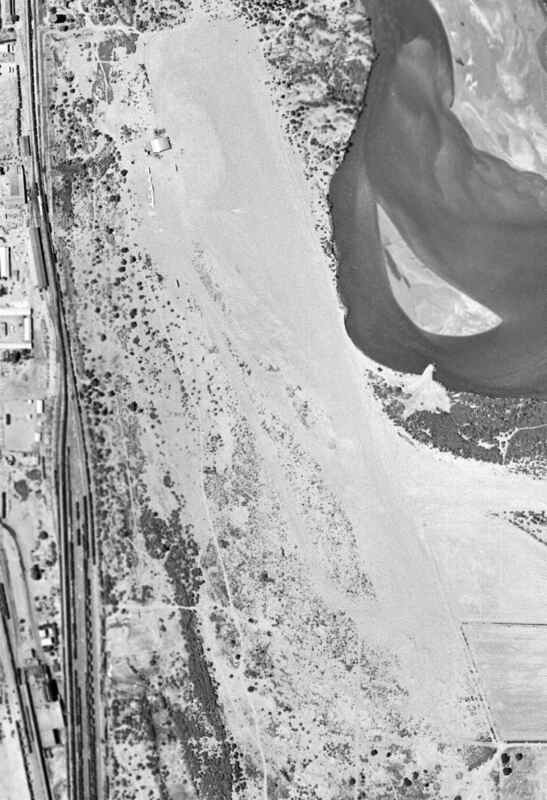 The last photo which has been located of Yuma Aux #3 was a 1955 USGS aerial view. but most of 2 paved runways & a connecting taxiway still remained. 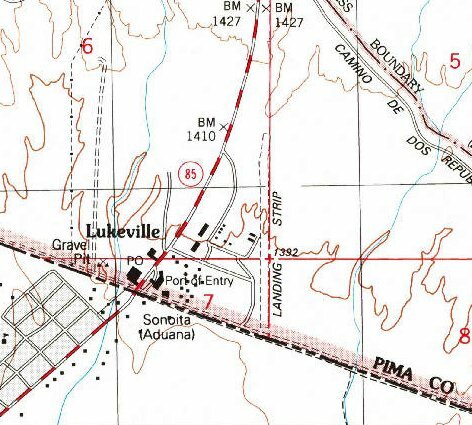 Yuma Aux #3 was not depicted at all on the 1965 USGS topo map. and not a trace appears to be discernible of the former airfield.